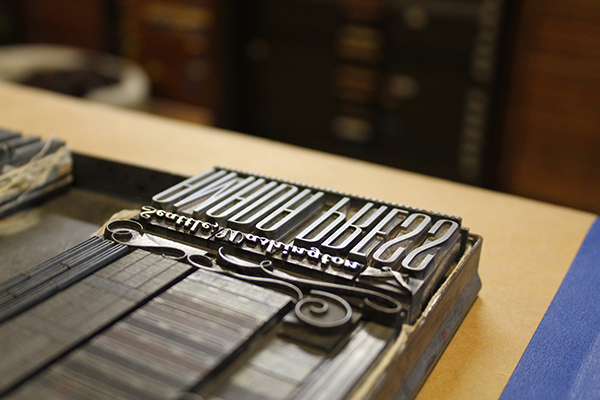 Most letterpress printers find a sense of home in the happy clinking & whirling of the press. Danny Rhoades of Creative Beasties Workshop is no exception. 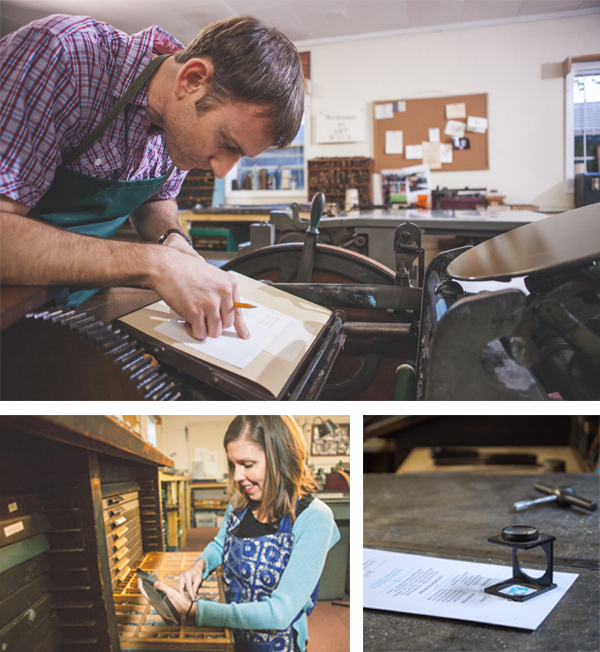 The IT-by-day and printer-by-night found the letterpress bug bit hard after planning his own wedding. 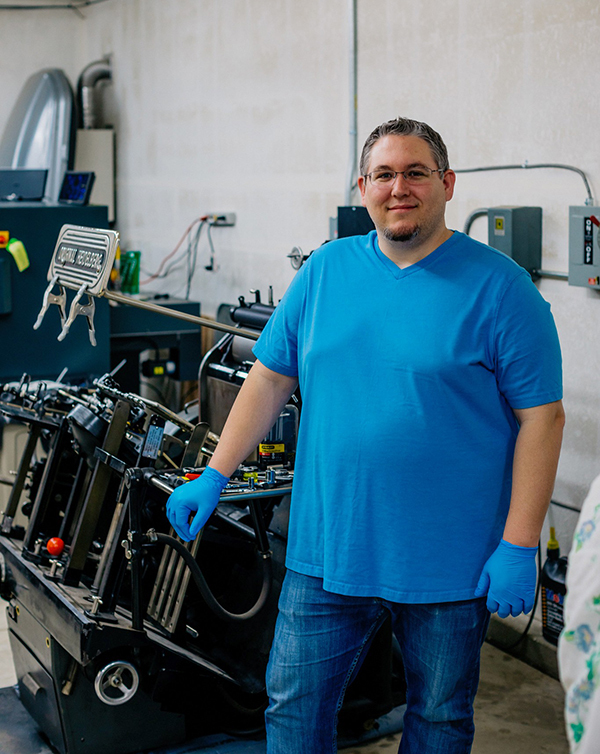 Turning part of his garage into his printing mecca, Danny finds inspiration in exploring creative options with his clients, his supportive family, and letting the press provide valuable teaching moments. 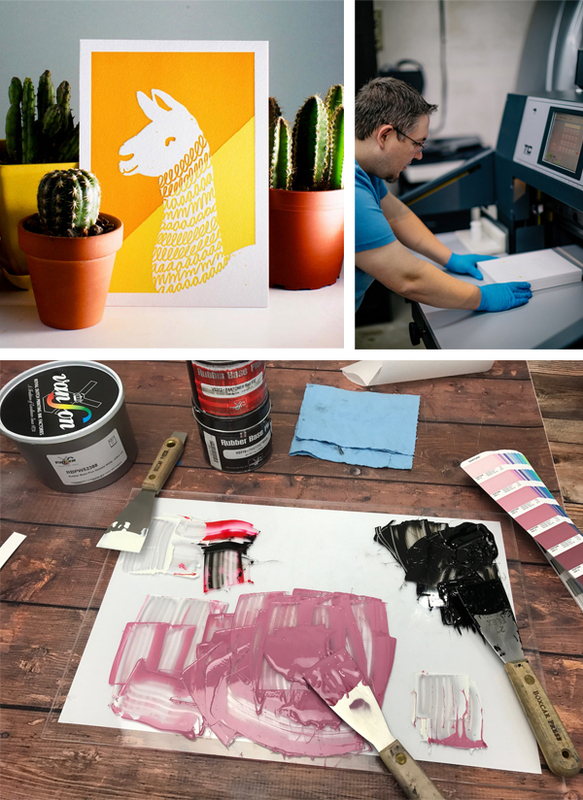 Since our last visit with Danny, he caught us up on new printing tricks, the feeling when registration is spot on, and the wonderful rhythms printing has played in his life. PRINTING JAM SESSIONS + FAMILY LIFE I’m a 37 year old married father of 2 adorable twin girls (age 2). It’s mostly me by myself printing since my wife is usually dealing with the kids. I sometimes have creative friends come over for printing sessions but other than that it’s just me. 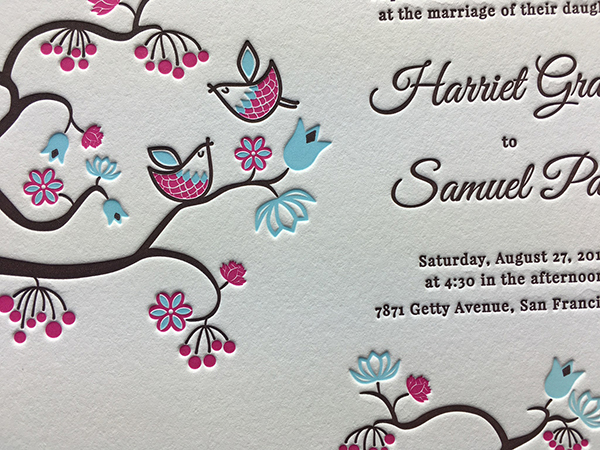 BLOSSOMING PRINTING LOVE When my wife and I were planning our own wedding we both got super interested in the invitation options out there and came across letterpress. I instantly fell in love and that eventually blossomed into Creative Beasties Workshop. PRINTSHOP EFFICIENCY Our workshop is in the tandem portion of our garage. 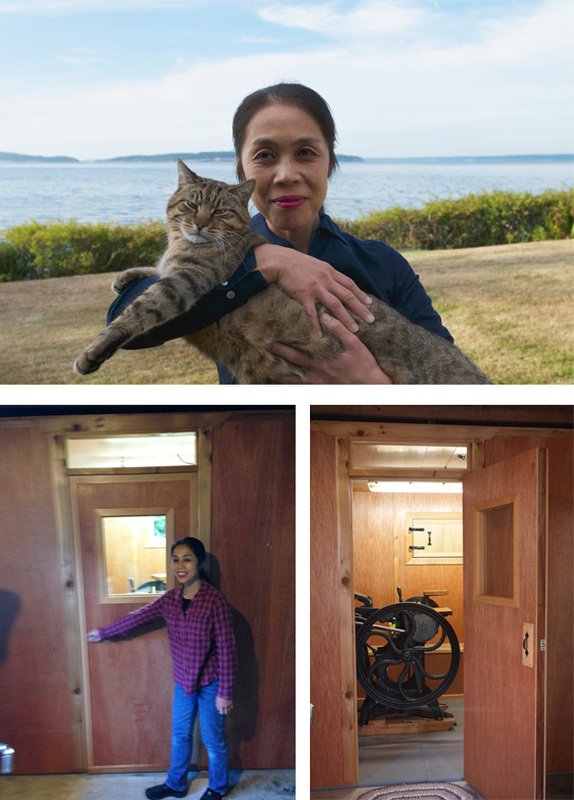 It’s only about 288 sq ft so it’s very limited. My favorite thing about it is the Heidelberg Windmill 10×15 press that brings it all together. AT HOME PRINTING We’re in a pretty new constructed suburban neighborhood. The most interesting thing about our home is that it backs up to a 20 ft. sound wall for Highway 65. PRINTING MENTORS One of the first people to teach me about letterpress was a gentleman I met on the Briarpress.org forums who goes by the handle, Inky. He taught both my wife and I the basics and helped us really understand the foundations of the process. I owe him a lot. PART TIME PRINTING, FULL TIME FUN I wish I could print full time, but with a mortgage and budding family, I can’t afford to do that just yet. I work in IT and my day job pretty much supplements our workshop quite a bit. DESIGN BROUGHT TO LIFE I don’t design as much as I’d like mostly due to time constraints, but when I do it’s usually after a lengthy conversation/meeting with the client to fully understand their motivation and inspiration so I can bring it to life and elevate it the best I can. One of my weaknesses is not knowing when to stop. This is something I am working on, and think I’m getting better … but I know it’s a flaw of mine. PRINTING FEATS One of my proudest moments occurred when I was able to produce a 3 color work, shortly after having trained only for three days on the press. The registration was perfect and the colors were spot on. PRESS HISTORY I learned on a C&P old style, but when I bought my own I went straight for the kill and got a Heidelberg Windmill 10×15. I didn’t even know how to use it! I was super scared at first and had to take a three day training to understand how to work it. BOXCAR’S ROLE Anytime I need any advice … or help with a job I can always count on Boxcar to be there to walk me through it. PRINTING TIPS For just starting out, don’t blame yourself too much. I blamed my inexperience a lot before I realized there was an actual problem with the press that needed to be fixed. The same thing happened with rollers. Once I changed to a different supplier things worked out much better. Sometimes, it is actually the equipment. WHAT’S NEXT I hope to continue printing and eventually build a client base that can support me printing full time. A big, huge Windmill-size round of thanks out to Danny of Creative Beasties Press! We look forward to seeing what cool, new projects come his way. 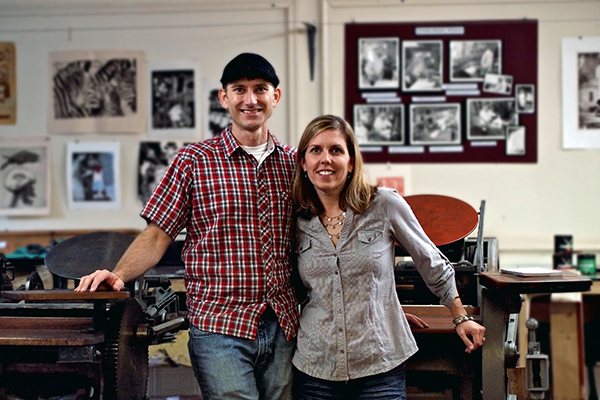 R&B Printery is a letterpress haven to husband-and-wife team Robin & Brannon Carter. 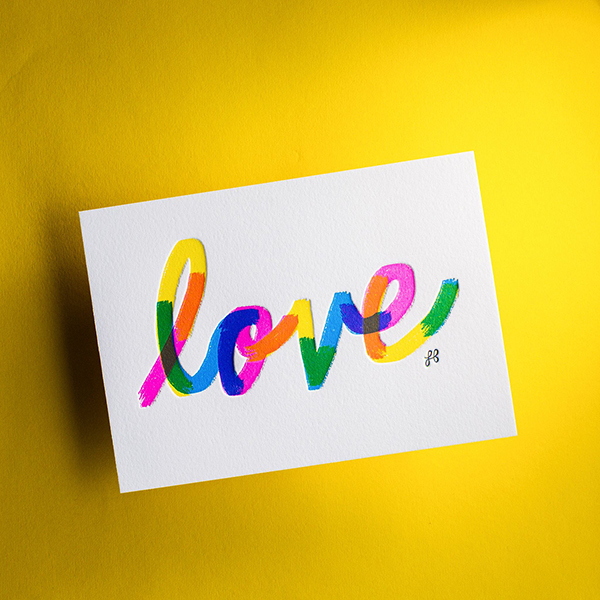 From down-south roots, clean printed impressions, pops of punchy color, and a whole lot of letterpress love, the South Carolina duo’s work continues to inspire. We catch up with the creative couple to talk shop, honoring their printing mentors, and the allure of pulling open vintage drawers of metal type for the first time. FROM REFRIGERATION INSPIRATION BOARD TO TAKING THE PLUNGE My wife Robin and I were already on a journey to discover a creative outlet that we could adventure into together when we happened to open an issue of Southern Living Magazine and read an article featuring 9thletterpress out of Florida. The old vintage press, stacks of clean paper, and colorful inks intrigued us. 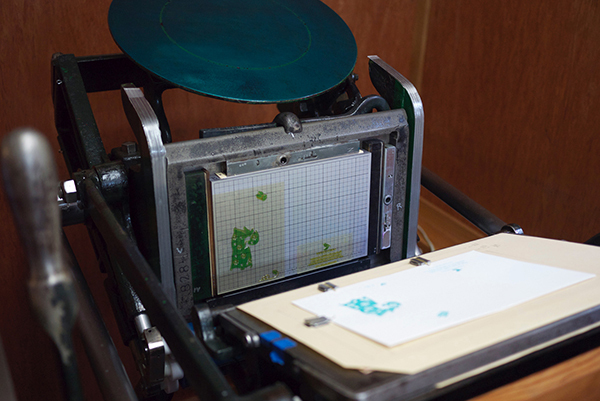 At the time, I really had no idea what letterpress printing even was! We tore out the article and hung it on our refrigerator for inspiration. A few months went by as we continued searching and talking about what would inspire us. One day standing in front of the refrigerator, I looked at that photo and said, “I wonder if there is anyone around us doing letterpress? Someone we could take a class from. 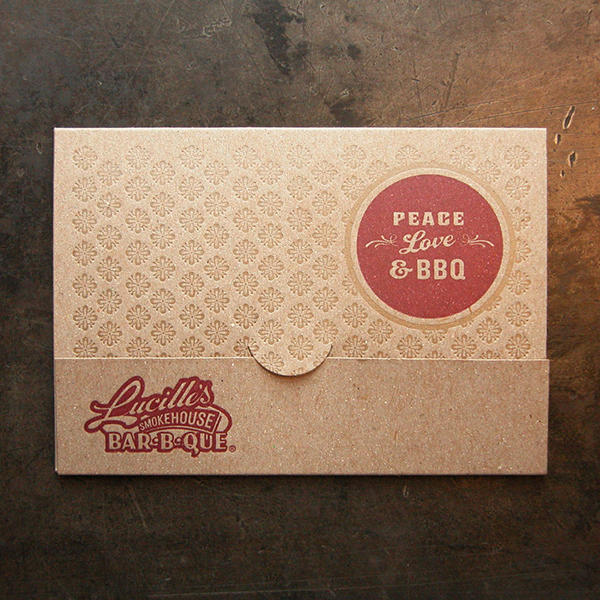 See what letterpress is all about”. 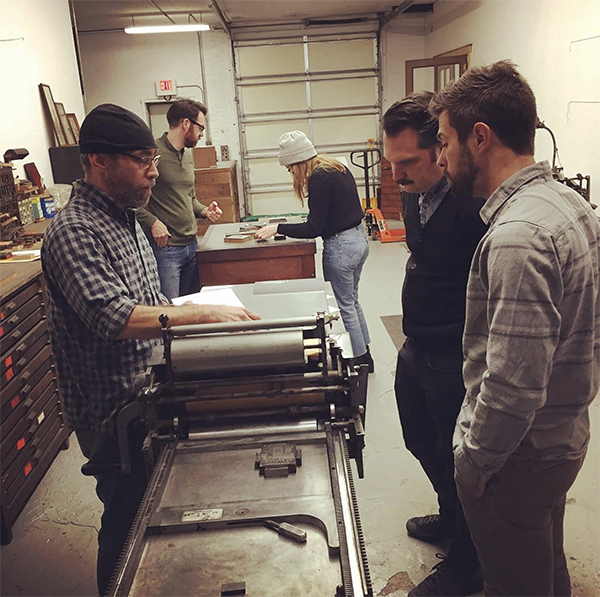 After some internet searching and a few phone calls to local artists, we discovered that there was this old guy in Spartanburg, South Carolina (at the time we were living in the next county over) teaching the art of letterpress. 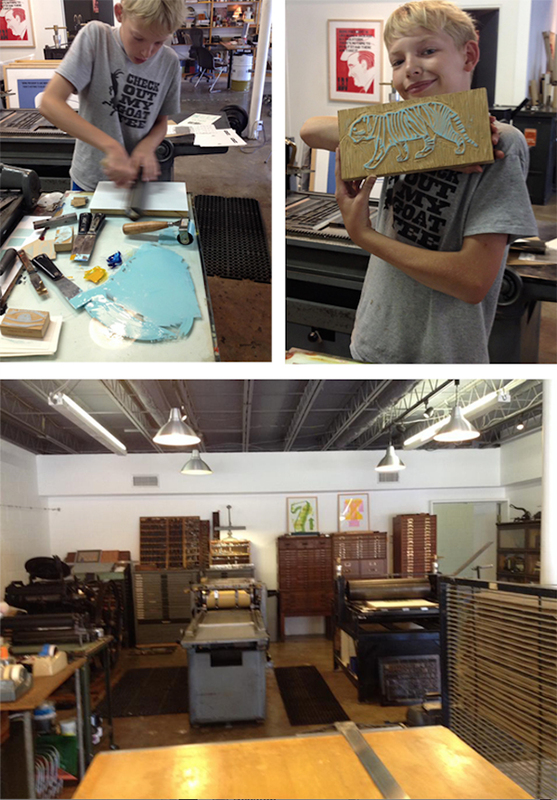 We looked him up and signed up for his introductory to letterpress class. We took the Intro class. Then signed up to take his Letterpress 2 class. Meanwhile, we discovered that the printing studio where he worked was part of an artists’ cooperative. The printing studio was amazing! Drawers full of old vintage metal and wood type, century old printing presses, and everything you’d need to have fun printing, all ready to go! 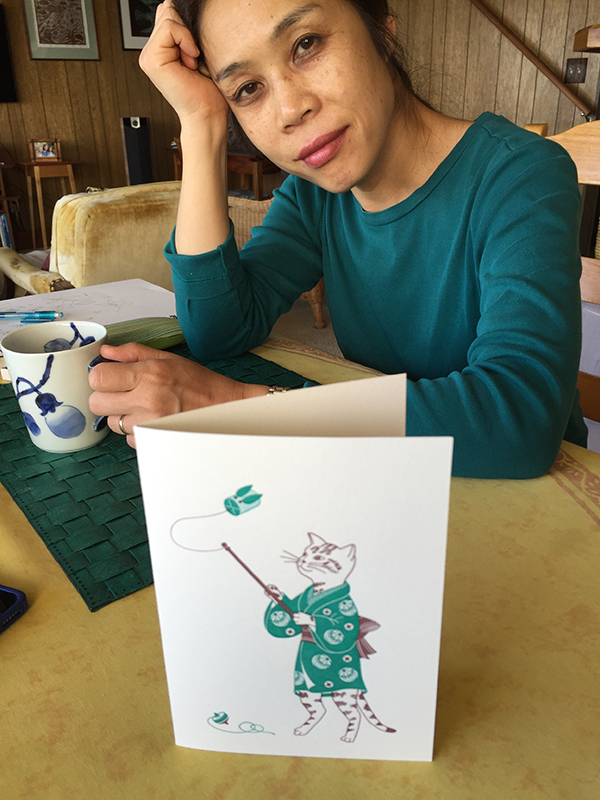 So, having no real background in art, other than childhood art classes for both of us in high school, we took the leap, signed up to be members of the West Main Artists’ Cooperative and set out to become real letterpress artisans! Oh, and that old guy became our mentor and cherished friend. 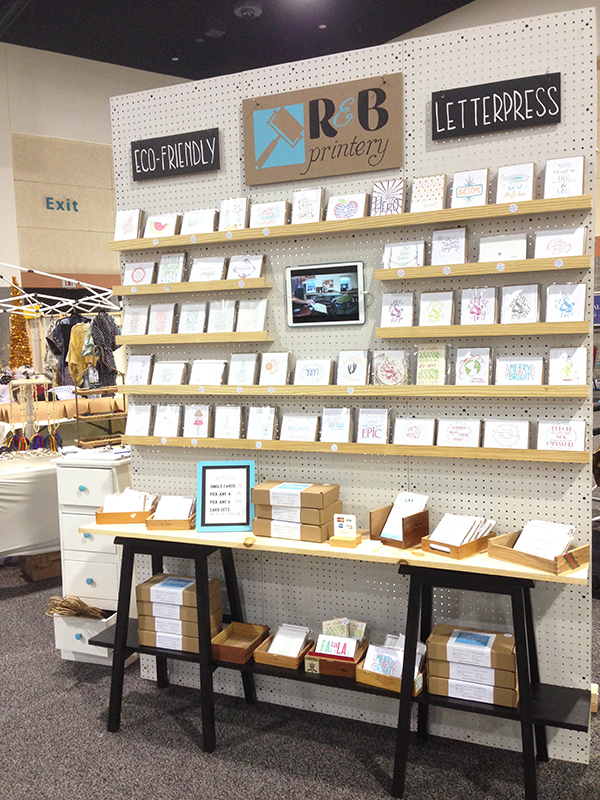 We ended up moving just to be near the presses when we officially launched R&B Printery! PRINTING IN THE PALMETTO STATE Our printing studio is in the basement of the West Main Artists Co-op in Spartanburg, SC. The Artists Co-op hosts creative spaces for 50+ local artists in an old renovated Baptist church building turned gallery and studio space just two minutes from the heart of downtown Spartanburg. As member artists of the co-op, we get to mingle and share creative space and ideas with some amazing artists. From other printmakers, to fine jewelry, ceramics, glass works, fiber arts, painting and water colors, to music, photography, and videography, the co-op is home to a breadth of creative talent. The city of Spartanburg, the only city in the United States with this unique name, has a vibrant art community centered around a Downtown Cultural District, featuring an array of outdoor art, including a new Lighten Up Spartanburg walking light bulb outdoor exhibition featuring 28 light bulb sculptures. We work out of the co-op for print production and our home studio (which is just a mile away – bought for that very location!) for design, inventory, and shipping. PRINTING MENTORS The late Mr. William “Bill” Wheatley (that old guy we mentioned earlier), was our mentor for several years and helped us through the beginning stages of learning the technical aspects of printing with vintage presses and equipment. Sadly, he died in 2015 but his legacy lives on as we try to continue what he started. 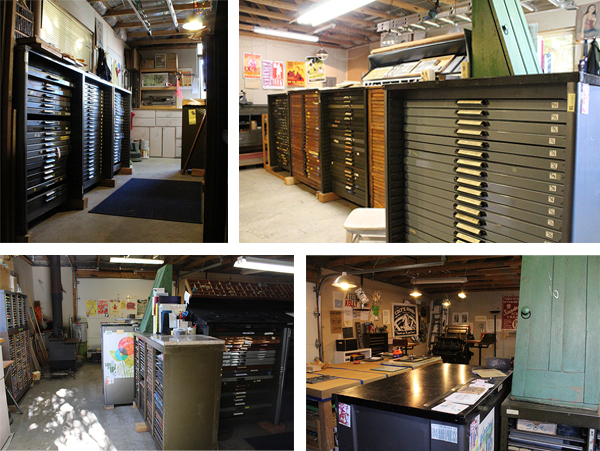 Wheatley worked tirelessly to build a printing space that could move beyond simply housing old stuff to be admired, to creating a living, breathing print studio that could run as a fully-functioning print shop. We still miss him. 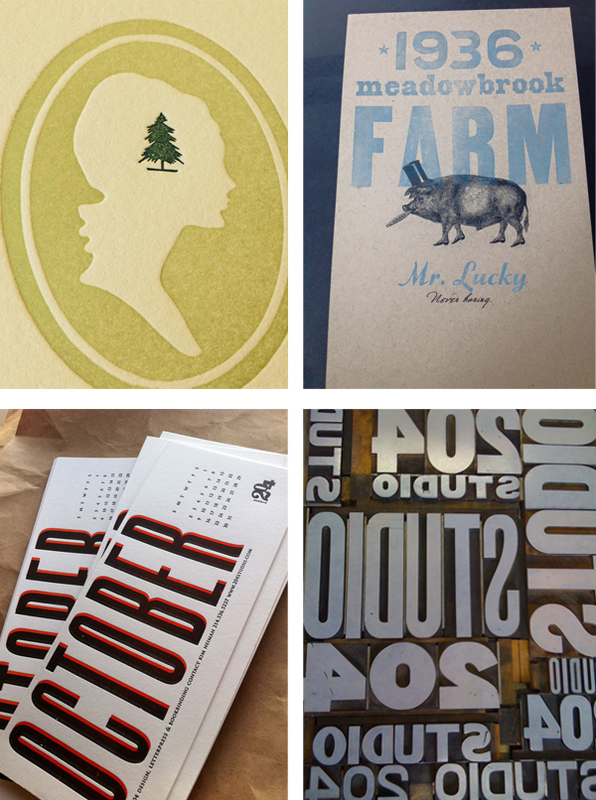 We love Instagram for its ability to find and follow amazing letterpress artists. 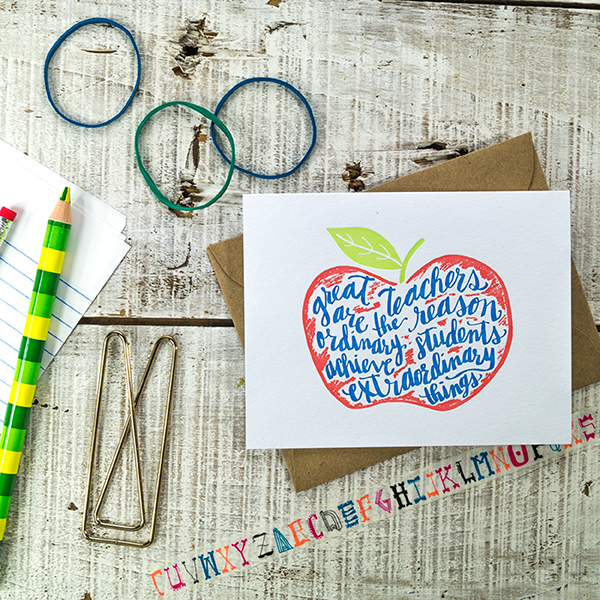 InkMeetsPaper, Waltzletterpress, Sunnymullarkeystudio and PhilipHunterBell are just some of the amazing artists that we follow and are inspired by. DESIGNER + PRINTING TEAM We are a husband and wife team living, working, and creating in the Upstate of South Carolina. We both grew up as creatives. Robin, in a house surrounded by a family and a lifestyle that nurtured the creative spark. I grew up from an early age drawing with a pencil through my early high school years, even taking AP Art. Our natural giftedness for art was set aside for both of us as we became involved in other school-related activities. 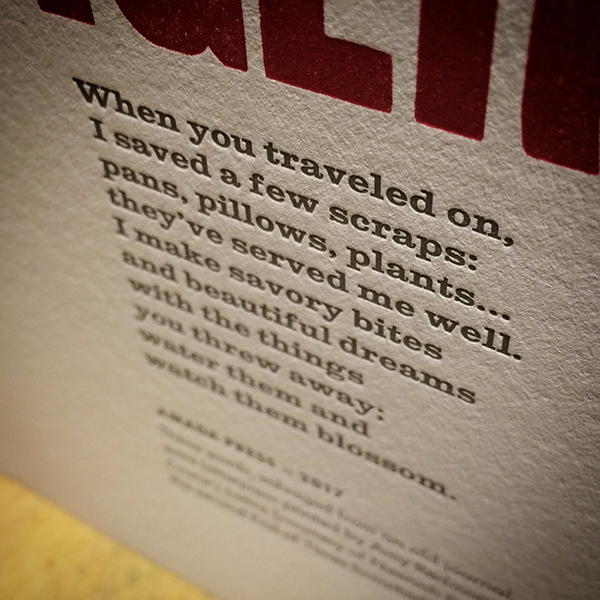 But, the small flicker of that creative spark is what brought us to letterpress printing. I love getting my hands dirty with activities such as positioning type in visually appealing arrangements. I also handled the digital design elements for our custom clients. Robin has always been drawn to hand lettering. In college, she was the unofficial banner maker for her sorority, hand painting most of their event banners. 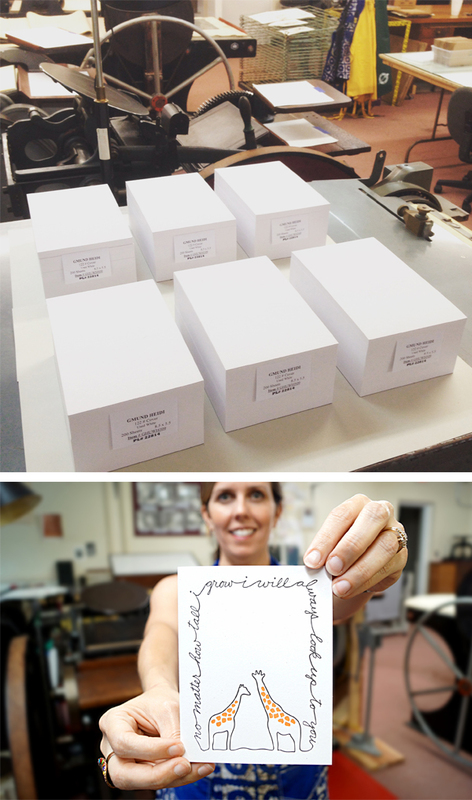 Hand lettering our line of letterpress greeting cards is now a major design focus for Robin. You can watch a short video of us working in our studio. We both hold Masters degrees in biology and have worked as professional teachers. Robin also has an undergraduate degree in Environmental Science. So, we both bring this need to protect the environment into our printing. 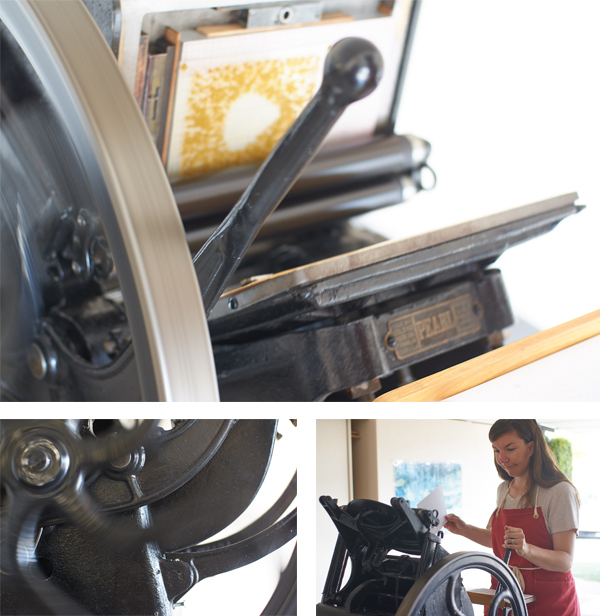 We consider ourselves first, an eco-friendly letterpress printing studio. 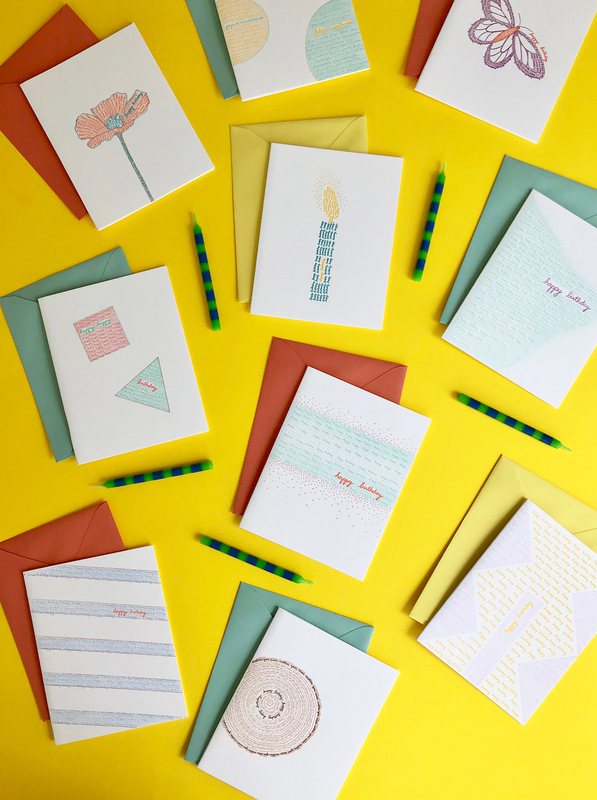 Our line of greeting cards uses a 100% post-consumer waste (PCW) recycled, 110# card stock manufactured in Germany and sourced locally here in the United States. Our in-house envelopes are also 100% PCW recycled and our clear card sleeves are made of a corn-based bio-plastic that is compostable and 100% biodegradable. We recycle papers and makeready materials through our production and packaging process, reusing and reclaiming scraps for other purposes. We also use soy-based inks, and collect discarded and reclaimed inks to keep them out of the landfill. FULL TIME FUN WITH A DASH OF PART-TIME PLAY Brannon has just recently, about 6 months ago, been able to devote all of his official “work” time to R&B Printery. Robin still teaches online high school, but devotes her time away from the classroom to designs, local artist markets, and social media. Maybe one day, we’ll both be free to pursue our creative side together full-time! PRINTING FEATS I think one of the biggest points of excitement for us is to look back at some of our very first designs and prints. 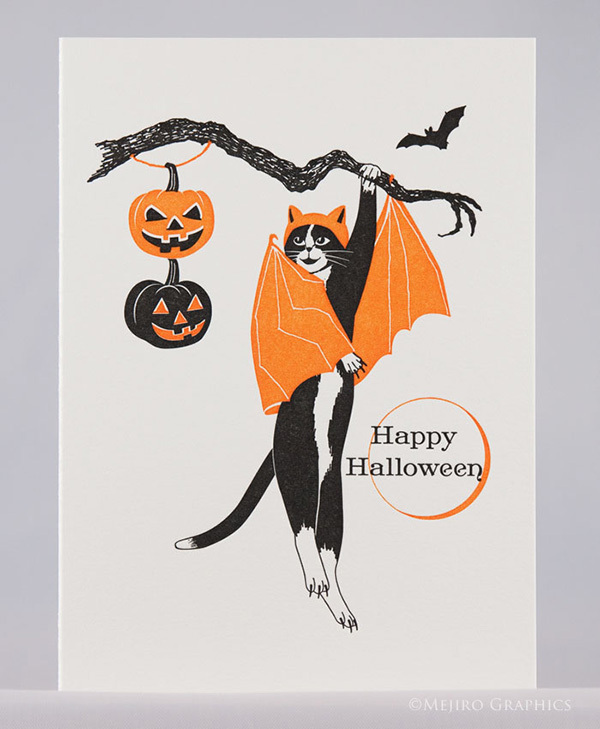 Cards we thought were amazing and that people would just love to purchase and put in the mail. To look back now, four years later and wonder “what were we thinking!”. Some of our early prints were terrible! 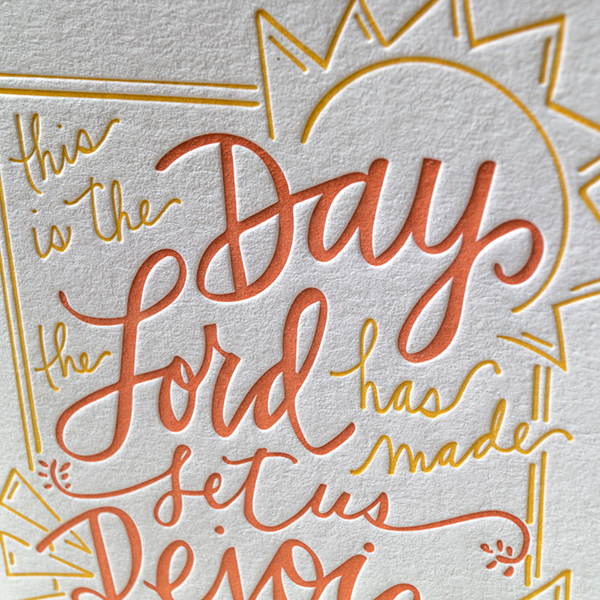 But looking at where we are now, that we’ve been able to persevere the highs and lows of starting and running your own small business, and to see that we can now truly print some wonderful letterpress pieces that our clients love, this just makes us ecstatic! We hope 4 years from now we will still look back and think the same thing about what we are producing today as evidence of continued improvement and ongoing growth! Another accomplishment we are proud of is that we’ve designed and built custom displays for participating in handmade markets and pop up shops. Our newest display is only a few months old but we debuted it at the prestigious Indie Craft Parade in September. It was a feat of engineering to build something modular so it would fit into our car while still being eye catching to draw in shoppers. We are super proud of the way we built in the ability to run a video of our process on loop with our iPad Pro as a part of the display. 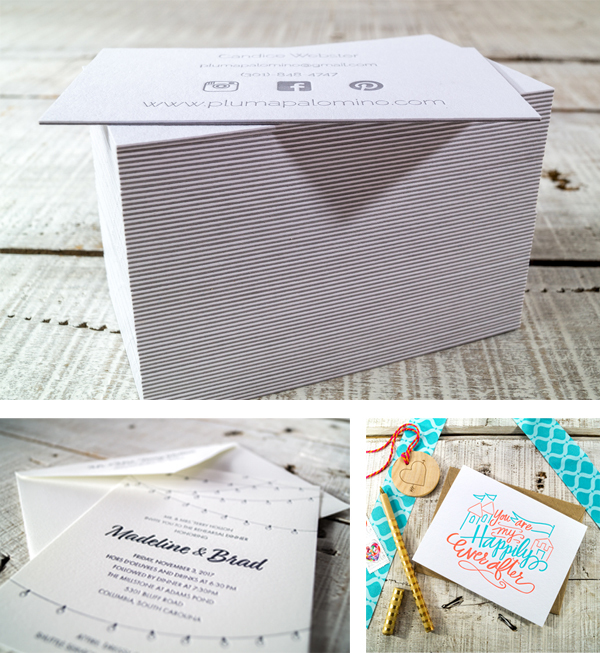 It’s proven to be a wonderful way to introduce new clients to our process and discuss ways we can print something custom just for them. MEET THE PRESS FAMILY As I stated earlier, we were lucky in finding the West Main Artists Co-op and being able to benefit from all of the hard work of those who built the printing studio from scratch. 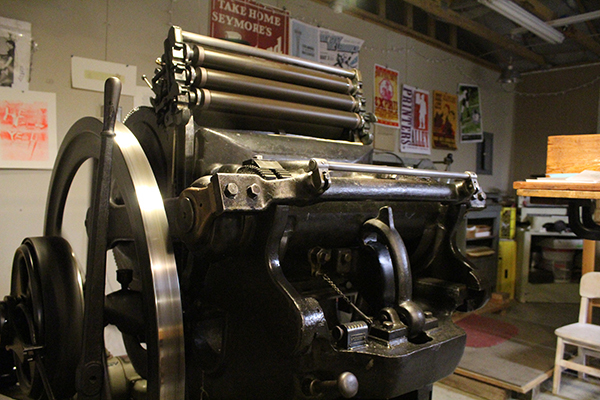 Our main workhorse press, that we started on and still use today, is a vintage 1906, 8×12 Chandler & Price old style. 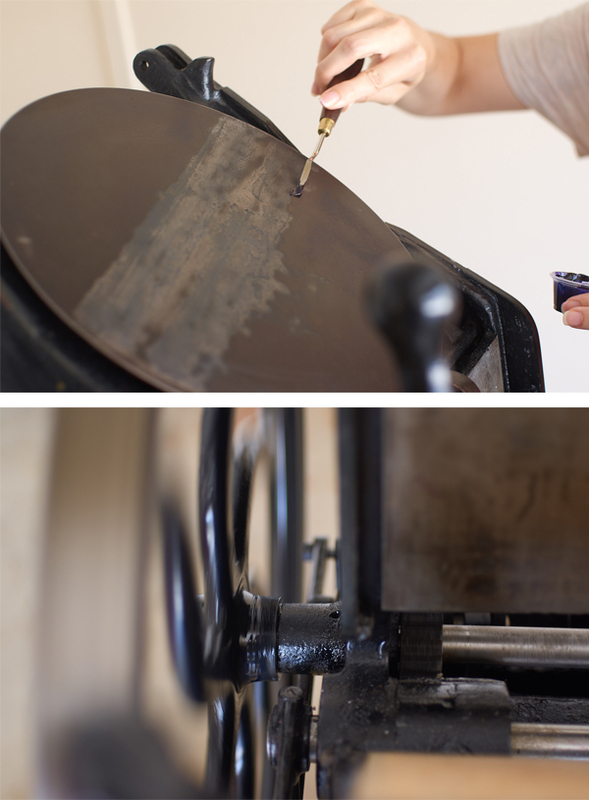 We are lucky to also have access to a manual Vandercook proof press that we use for some custom projects. We also have a newer 10×15 Chandler & Price Craftsman style that we’re in the final stages of getting operational. 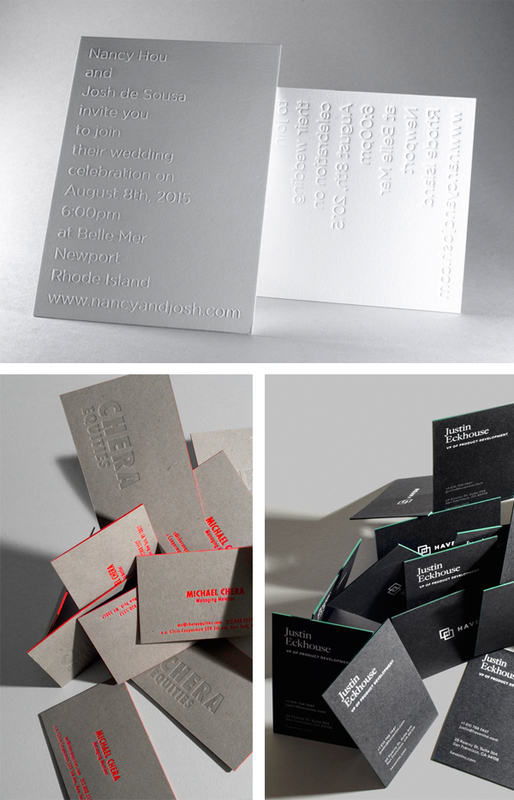 BOXCAR’S ROLE Boxcar Press is our go-to provider for everything photopolymer. We use the Boxcar base + photopolymer plate system and have found the team in platemaking to be extremely knowledgeable when questions arise. It feels like we have a team of people working for us when we send off designs to have made into plates. Every once in a while, I’ll get a call from platemaking to check on a rendering aspect of our design which we greatly appreciate. 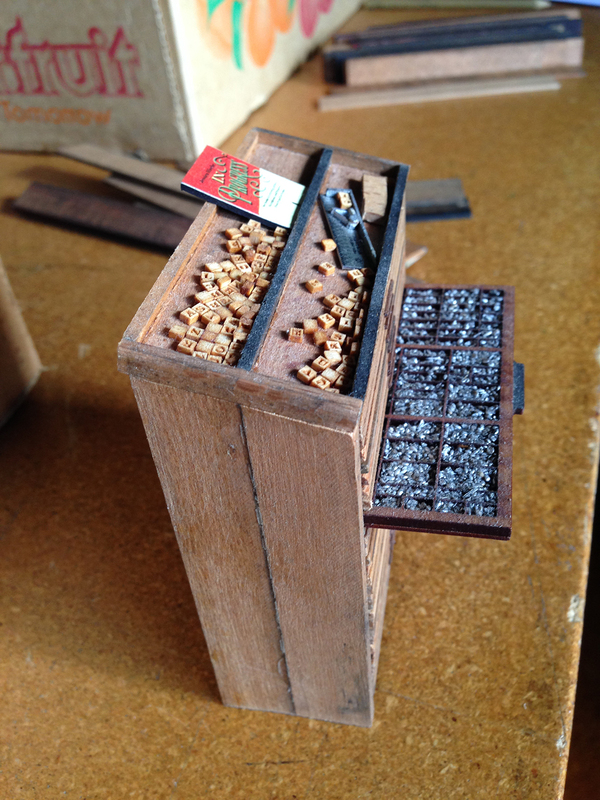 The Boxcar videos on setting the roller height of our presses using a roller gauge were extremely helpful early on. The blog and articles at Boxcar and the discussions posted on Letterpress Commons have been invaluable during the learning process. SHOP TIPS I write and mark all over my boxcar base during makeready and setup. Periodically, I need to clean up my base and start with a clean slate. I’ve found that Mr. Clean Magic Erasers do an AMAZING job of bringing my Boxcar base back to life. Two minutes and a Magic Eraser and it looks like I’ve bought a new base! WHAT’S NEXT Our biggest goal for 2018 is to expand our name recognition in our community, the Upstate of South Carolina, and across the State. 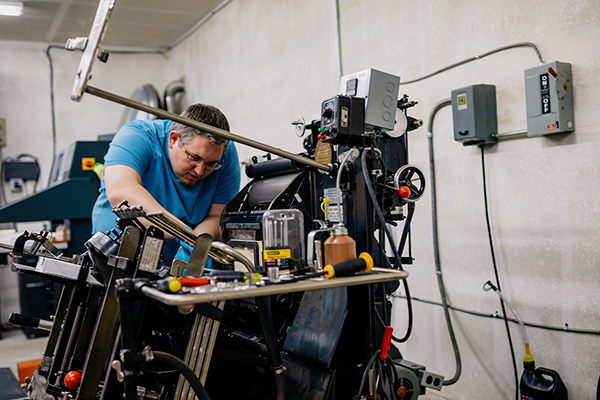 We are printing projects for clients all across the U.S. but we want to let people in our own state know that they don’t have to go far away to fill their letterpress needs. We’re right here, close to home. Immensely huge round of thanks out to Brannon & Robin of R&B Printery for giving us a look into their lovely printing world! 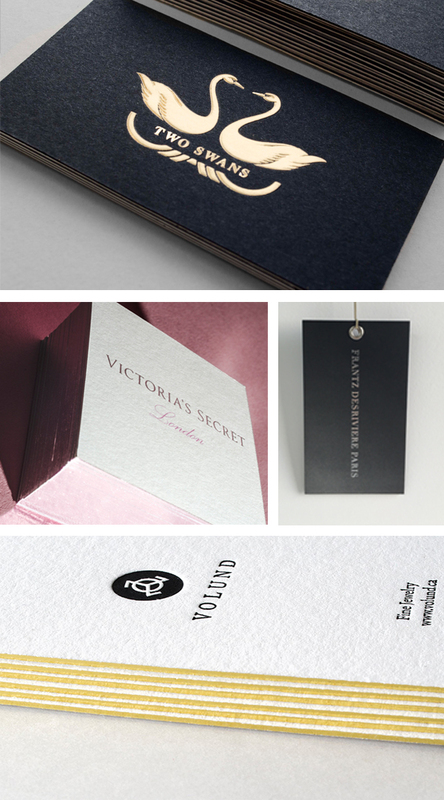 From luxury letterpress printing to honing their newest & hottest bespoke design trend, Publicide Printing breaks barriers and redefines artisan printing with fleet-footed service. 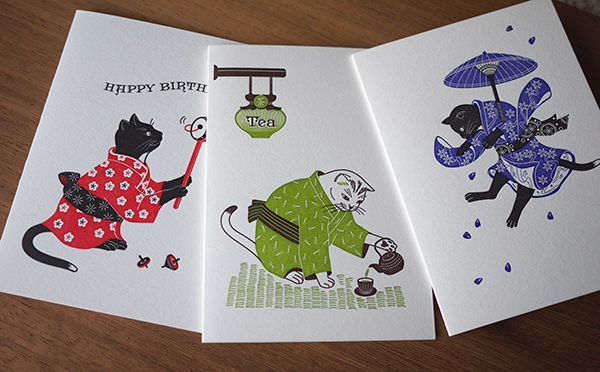 The New York City-based print shop celebrates 11 wonderful years of printing excellence (and counting! 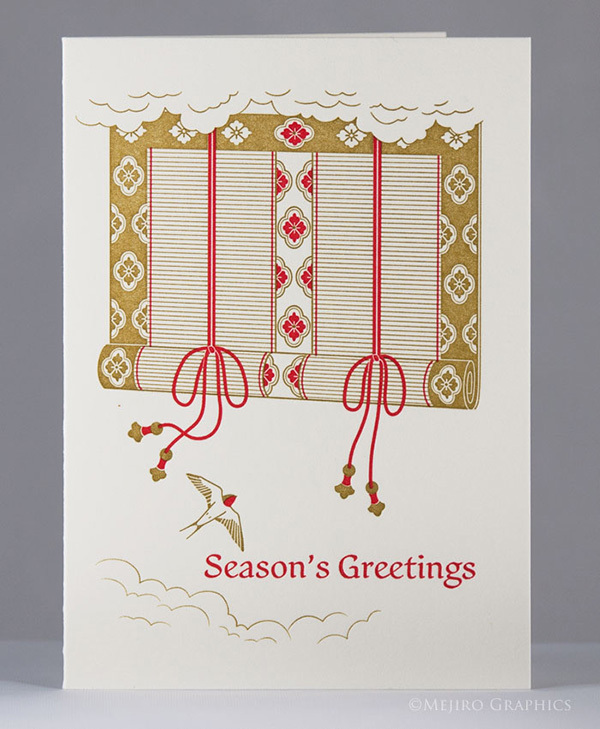 ), while sharing with us what’s in store for them next–from taking fresh inspiration from the bustling city around them to honoring the addictive craft that is letterpress printing and beyond. IN THE HEART OF THE BIG APPLE Publicide Printing is located in the Historical Times Square District–rife with the filth & fury New York should still be known for. 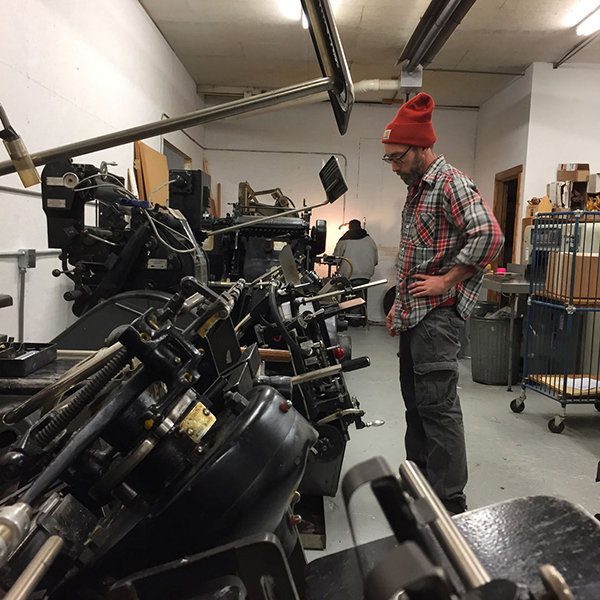 At our NYC Print Shop we find the clamor of trucks, buses, freaks, geeks, tourists, and morning-shift strippers to be suitably inspiring matches to the clamor of our Heidelberg Presses and Kluge Machines. 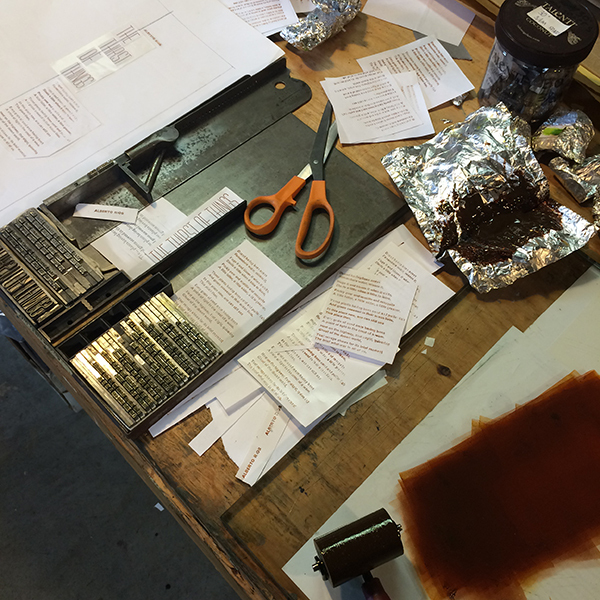 To the clamor’s credit, the racket brings a paradoxical equal/opposite effect to the print jobs rolling through our sleepless workshop. There’s nothing like broken-glass glitter, flashing signs, and non-stop commotion to provide a super-neat registration. 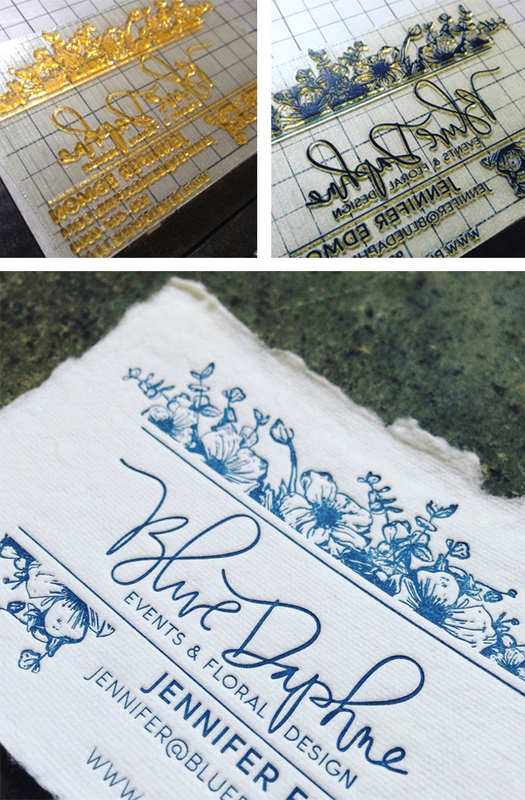 We can fathom few other explanations for the continued presence of Holographic Foil Stamping in our personal and Commercial Printing. THE PRINTING DRIVE We attribute much of our success to situational circumstances. 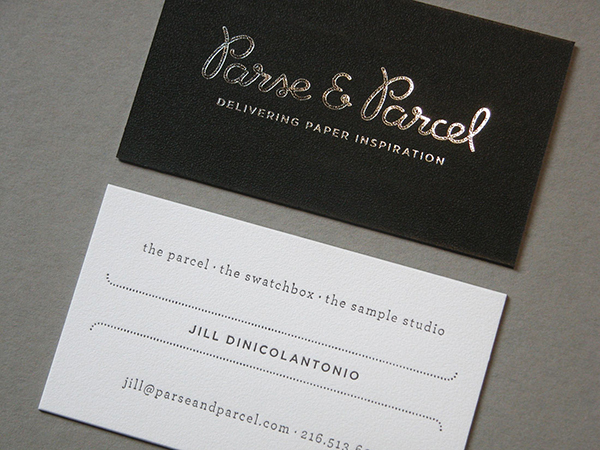 When we set up shop 11 years ago, we kept our techniques traditional, providing letterpress services to a totalitarian degree. 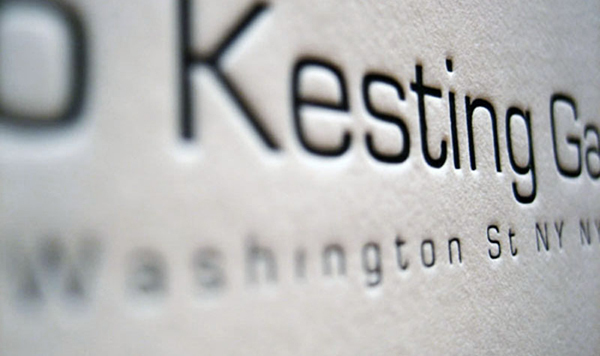 Devoted to pushing the letterpress “bite,” we’d like to think we became the go-to printer for deep impression, dimensional prints. Naturally, we credit the influence of our original Hudson Square locale–the mid-century’s center of book printing & publishing–for giving us the proper juju to succeed. Speaking of books, we first began branching beyond our love for Letterpress Business Cards & Stationery as requests for unique, custom Lookbooks made their way through the door. Lookbooks & Hanging Tags have become a shop specialty as of late, prompting us to include High Quality Digital commercial printing to our cabal of custom services. EXPONENTIAL GROWTH As the fashion world kept calling, we found our lease terminated: a gift that took us to our current post in midtown Manhattan, while honing our expertise in Corporate Stationery Printing, Brochure Printing, Spot UV Gloss & high-shine Glossy Lamination Services, Asset Management, Real Estate Printing, Emboss & Deboss, and–as the nearby ghosts of Studio 54 would have it–unlimited Event Printing. LOOKING TO THE HORIZON The future is truly unknowable. Come 2049, we know we will still be at it, no matter what form the printing arts take. We go to sleep hoping for the following: (1) the advent of 3D-printed Pantone Color & Color-Matching; (2) to find the majesty of Foil Stamping integrated into respectable Letterpress Studies; last but not least, (3) a global craving for gigantic solid color by way of oversized, overprinted Offset Floods, with boundless room to create melting duo-tones and tri-tones. An immensely huge round of thanks to Publicide for letting us have a sneak peek into their fantastic and inspiring printing world! 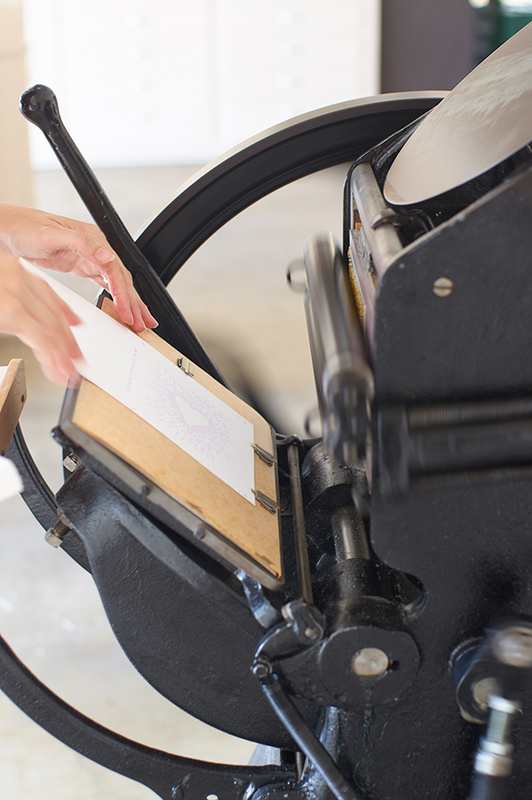 A mindful approach to letterpress (and life) is the buzz behind Amy Redmond of Amada Press. 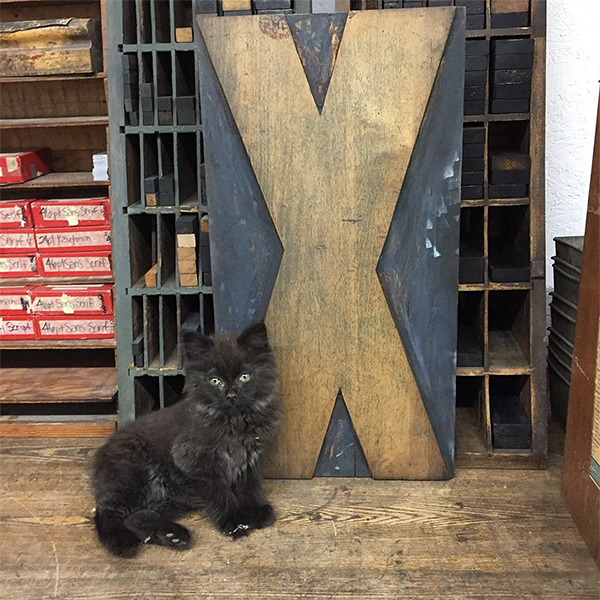 When we last caught up with Amy, she had a ball visiting & touring the Boxcar Press press floor. 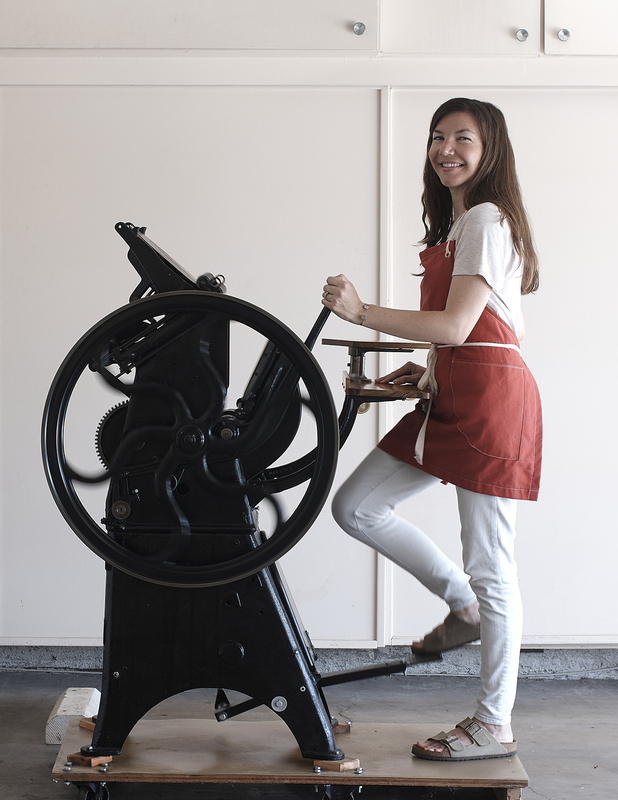 Now, the Seattle-based printer, visual artist, and instructor for Seattle’s School of Visual Concepts is blending a sense of creative well-being into her craft while nurturing a closely-knit community of printers. Between collaborating on her next project, keeping the fire lit under her fingertips, and happily giving back to the community with her involvement with the SVC Childrens Broadsides project year-after-year, Amy lives up to her press’ Spanish name origins: beloved. half-tones, and adding linocuts when inspired. In recent years, I’ve been incorporating collographs and pressure printing into my work. I primarily print on a Colt’s Armory 13×19 platen press, but also work on a Vandercook 4. This is the form for the keepsake from my first studio tour under the name Amada Press. All photos courtesy of Amy Redmond unless otherwise indicated. 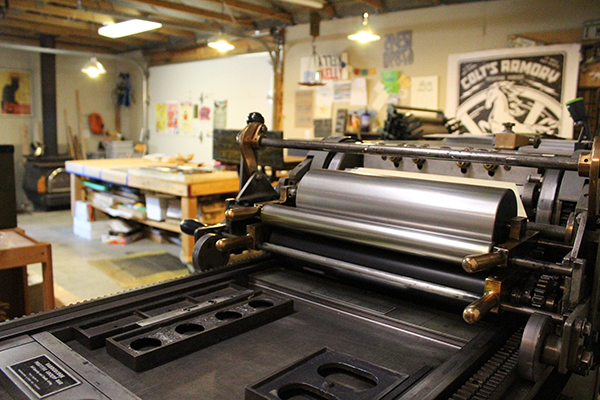 View of the Amada Press studio from behind the Vandercook 4, which also came from Stern & Faye Printers. 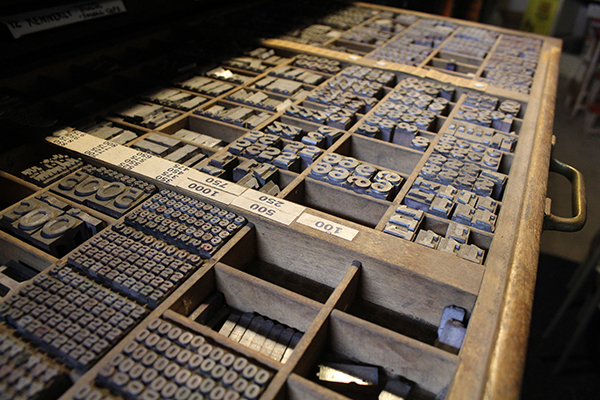 THE LURE OF LETTERPRESS My first job out of college was as a book designer, and it turned into a quest to learn more about the finer points of typography. I was also feeling the loss of not working with my hands — computer design time had been balanced by working with tangible materials while earning my BFA. Although gainfully employed in the creative field, I was effectively starving myself creatively. 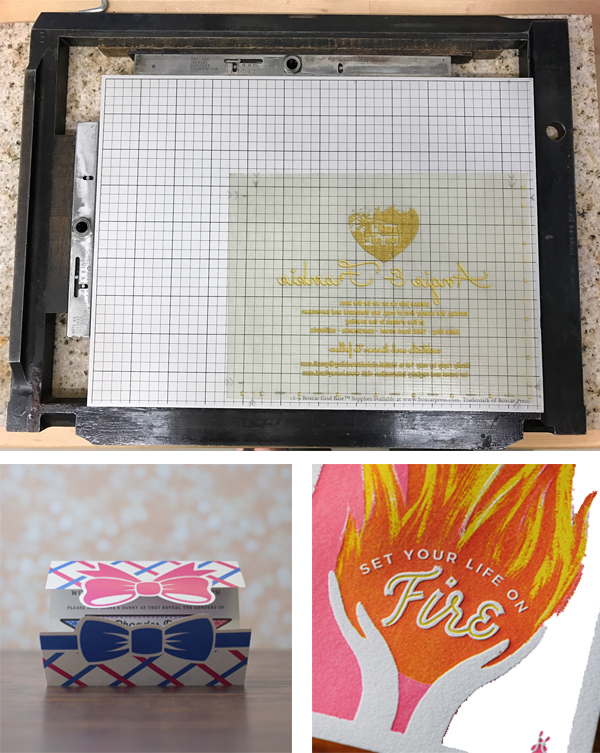 That changed when a friend saw a listing for a weekend workshop with Seattle artist Bonnie Thompson Norman (Windowpane Press), and I thought letterpress would be the perfect remedy for me. It was, and still is. Halfway through the first day, I was hooked on setting type by hand, so much that Bonnie had to politely kick me out of her studio so that she could go have dinner — promising that the type would still be waiting for me in the morning. 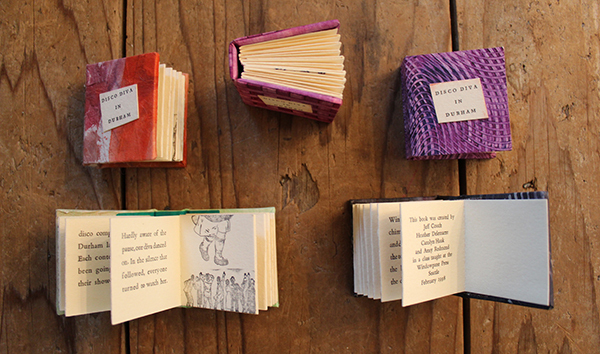 These accordion books were the first letterpress project I ever typeset and printed, in collaboration with 3 other students. Bonnie runs an admirably tight ship: we wrote, printed, and bound these in just 2 days! Six months later, in October of 1998, I met Chris Stern and Jules Faye (Stern & Faye, Printers) at a Seattle Literary event called Northwest Bookfest, and fell in love with their work. The following week I drove up to their Print Farm in Sedro-Woolley, Washington to share my portfolio. The interview turned into dinner, and soon after I began apprenticing one day a week in their shop, doing whatever was needed in exchange for learning. 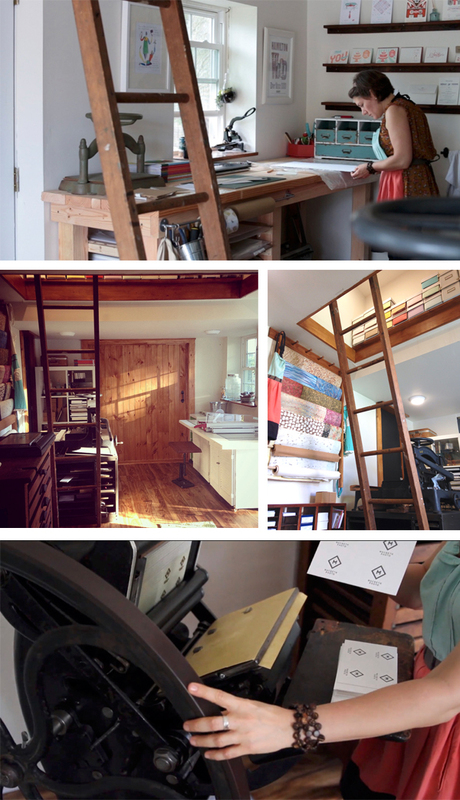 A few years later, I put all of my things in storage, moved into a small corner of the upstairs bindery in the print barn, and worked in exchange for rent. 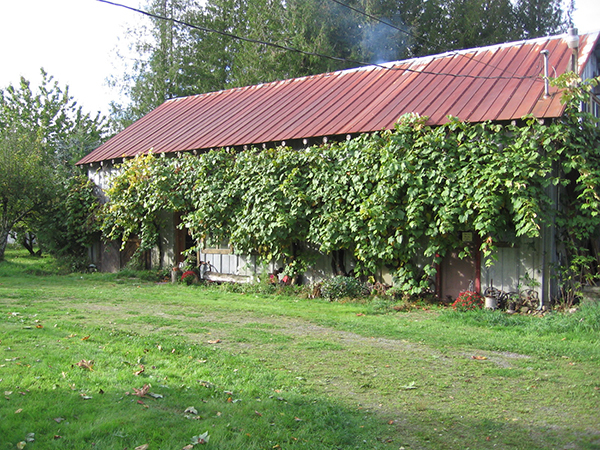 This was Stern & Faye Printer’s “print barn” in Sedro-Woolley, WA. The concord grapes would hang heavy on the barn, and it was impossible to resist snacking off the vine every time you entered the shop. 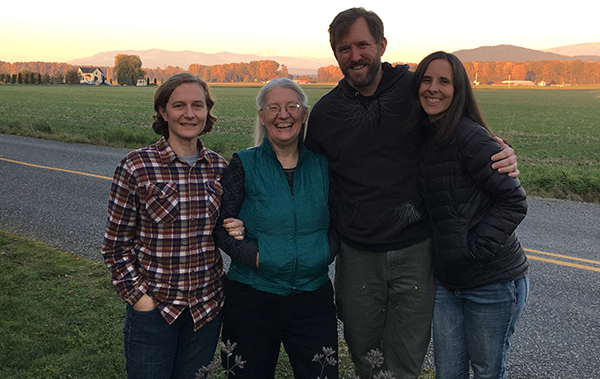 The 180-mile round-trip drive up to the Skagit Valley each week was well worth it. It’s hard to believe it’s been 19 years since then; it was such a pivotal moment for me. It not only instilled a sense of creative well-being and fine craftsmanship, it also introduced me to an amazing community of artists, designers, and printers that have become dear friends. NORTH SEATTLE’S BEST KEPT SECRET My private studio, Amada Press, is just steps from my back door in a quiet neighborhood in north Seattle. I describe it as a garage with a detached house — because that’s exactly how I went about looking for space: the studio came first. When Jules Faye approached me in 2008 about becoming the next steward of Stern & Faye’s Colt’s Armory 13×19 Press, I knew it was time to get serious about buying a place. I’d been in Seattle long enough to know that I couldn’t own a press that big and be at the whim of a landlord. The stars happened to align at the right time with both work and the burst of Seattle’s real estate market, making it all possible. 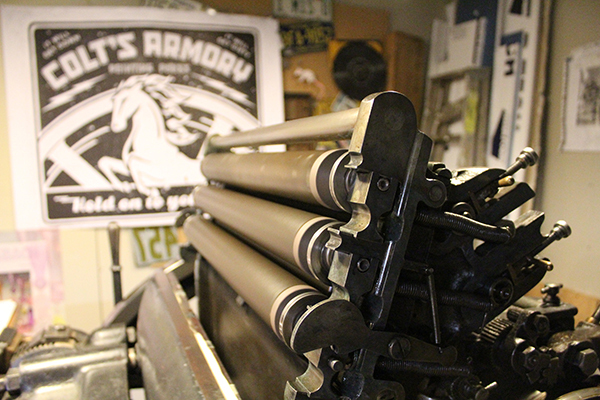 Inking up the Colt’s Armory Press. Cleaning up the press, and all 8 of its rollers, takes me about 30 minutes. 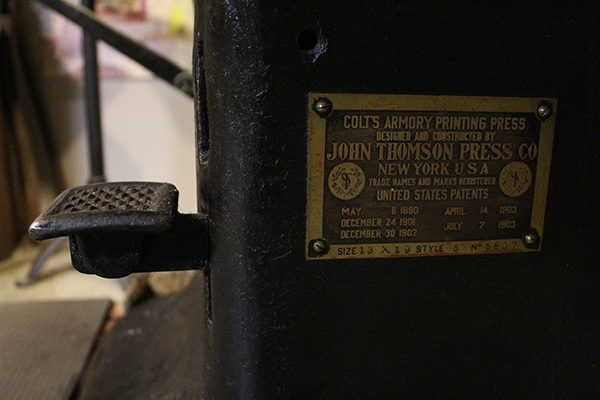 Close-up of the badge on my Colt’s Armory Press. In spite of being large enough for 3 cars, my shop has never had one in it — the previous owners were also artists, and built it as their painting studio. It has flat, alley access with high overhead clearance for big trucks, smooth cement floors and plenty of outlets. What really charmed me was its wood stove — that’s exactly how we heated the Print Barn at Stern & Faye. I took all of those things, along with the apple tree (Stern & Faye also had a tiny orchard), as signs that this was the right place for me. The press was the first thing that got moved onto the property — it took another week for me to move my personal things into the house. So you can see where my priorities lay. My shop’s sunny location makes it the perfect spot to grow tomatoes. A little bit of Seattle history lives in this photo: those red bleacher chairs are from the Kingdome, saved before it was blown up to make way for a new stadium. What truly makes my shop special is what’s inside of it — it has all come from local printer pals, many of whom have since passed. Most of it, like my presses and type, is from Stern & Faye and Byron Scott — but I also have a cabinet and slant top from Jim Rimmer (Pie Tree Press), and a handful of choice cuts from Maura Shapely (Day Moon Press). It’s all very beloved to me… which is how I came to choose “Amada” as my press name, the Spanish word for beloved. It also happens to be the meaning of my first name. Upper lefthand photo: Everything in my studio is up on 4×4’s so that it can be easily moved with a pallet jack. | Upper righthand photo: Thanks to the careful curation of past printers, I have many lovely typefaces — but Spartan (ATF’s version of Futura) claims most of the space in this row of cabinets. | Lower righthand photo: These are my two main work surfaces: the cabinet in the foreground is a staging ground for my notes, and the larger work table in the background holds my stone. | Lower lefthand photo: This photos is the view when you walk into my studio — the cabinet on the far right is the very first one I got (complete with the obligatory case of Copperplate). PRINTING MENTORS AND INSPIRATION Chris Stern & Jules Faye will always be my number one mentors; even though Chris passed away in 2006 and the context of my work with Jules has evolved, I consider my apprenticeship to be lifelong. They have given me so much of their time and talent, and never restrained their passion for print & typography. When the two of them collaborated on personal projects, the final print was always a tapestry of fantastic stories and captivating imagery. Their print, “The Typographic Horse,” exemplifies the “love at first sight” effect their work had on me. 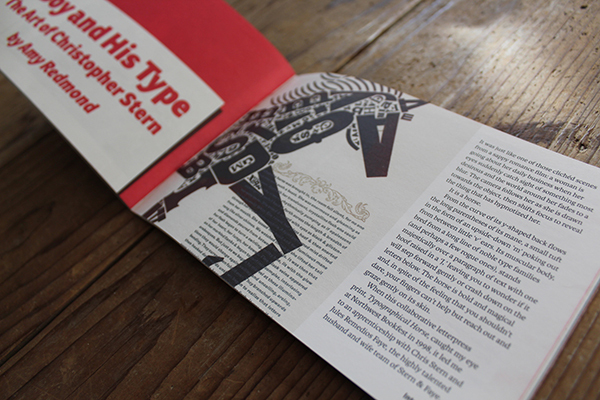 Shortly after Chris Stern passed away, I wrote an article about the passionate process of artwork for the Society of Typographic Aficionados . You can view more work by Chris Stern & Jules Faye on SternAndFaye.com. I also find inspiration from my ever-growing network of printer pals and students — they all keep a fire lit under my fingertips, and Instagram has played a big role these past few years with feeding me a steady drip of amazing work. Those who really stand out are the ones with determination and a clear vision in their work as a whole; I really admire that — it’s not something I come by easily. From an aesthetic standpoint, I’m drawn to the graphic design work that took place between the 1910’s and the 1950’s. As a design student I didn’t understand how the work I admired by Fortunato Depero, Piet Zwart, El Lissitzky, H.N. Werkman, and Jan Tschichold was produced — becoming a letterpress printer who works with handset type brought a whole new appreciation to it. It’s like I found a missing piece to the puzzle that is myself. DESIGNER + PRINTER I fall into the designer/printer category; they are very intricately related and it can be hard to tear one apart from the other. 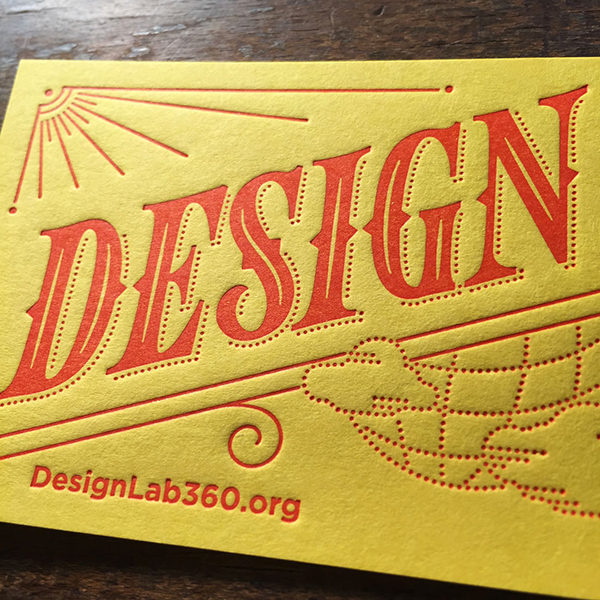 Design is what led me to letterpress, but letterpress is what reinforces my attention to detail and ability to think about how a design will be produced — whether it’s a website or a printed piece. When you’re printing your own work, you’re the one that pays the price when you design something that’s hard to pull off. And so you learn how to plan. 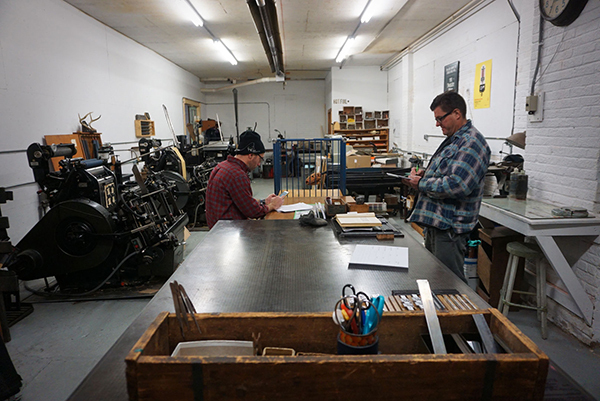 I find the mindful approach that letterpress requires to be blissfully consuming; it’s a nice contrarian lifestyle to the on-demand parts of life. As I browse my collection of metal type and ornaments, I slow down, I notice, I contemplate, I dream, and I plan. I form connections with things I’ve seen or heard. Stories materialize as excerpts from imagined conversations. This text, from my print “Scavenger,” was taken from a scrap of paper I’ve been carrying around in a sketchbook since 2006. The computer has no place here — pencils, scissors, Xacto blades, and glues sticks are crucial to my work’s development; the tangible trace of my hand is evident yet invisible. 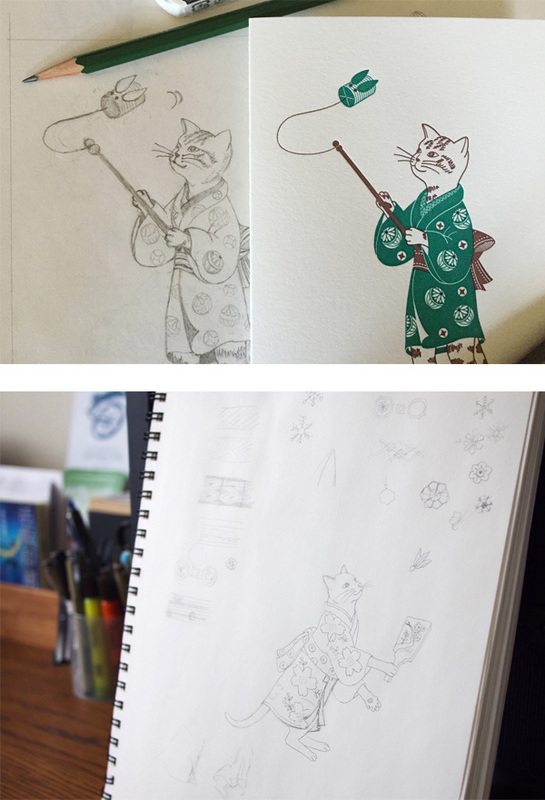 Ideas become sketches, ink is drawn, mock-ups take shape. Text is set, one letter at a time. 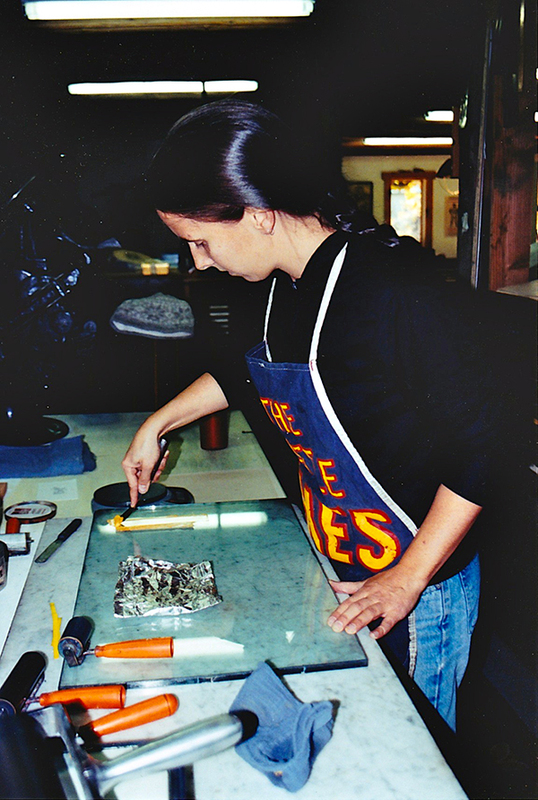 Images may be old ad cuts, or created with collographs, pressure printing, or carved linoleum. A snapshot of the design process for the broadside for “The Thirst of Things” by poet Alberto Ríos, for Copper Canyon Press. See the finished print here. Precision on press requires planning, but with my art I allow room for migration once ink hits paper: colors may shift, misfeeds inspire new compositions. The process of acting/reacting is cathartic; committing an idea to paper simultaneously invites resolution to old problems and invites opportunity for new ones. In the dead of winter this mindfulness is emphasized even more: my shop is heated primarily by a wood stove, and I can’t just start printing without some planning. The night before, I bring the inks and photopolymer base into the house to warm up; I check to make sure an air quality burn ban hasn’t been triggered by a stretch of cold, windless days; I prep a pot of homemade soup for lunch. On press day I get up early and get the studio’s wood stove started so that it can pick up the electric heater’s slack, and simmer the soup on the wood stove next to my coffee. Once I get going, I hate having to stop to make lunch… and it makes for the most delicious-smelling print shop. PART TIME PRINTER, FULL TIME FUN There are days when I think I could be a printer full time, but I don’t think I really want that — it’s having variety in my work that keeps me sane. I currently set up my work week so that I work Monday–Thursday for my design clients (web & print), and spend Fridays in my studio. Anyway you slice it I’m just a one-woman shop, so there’s a lot of pressure to stay profitable and still be able to invest in my retirement. 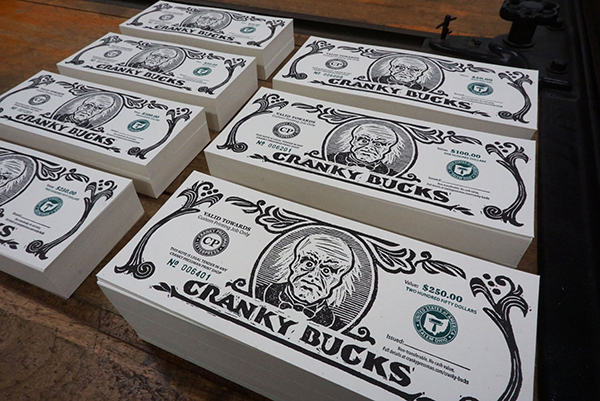 If I could spend my days playing on press, making art without a care for income, then yes I’d do it in a heartbeat. But if I have to take on a job printing what someone else has designed, then no — I’d rather that time be spent doing digital design, so that my print studio remains a stress-free place to be creative. There’s enough separation between how I think about the two different types of work that they fuel, rather than drain, my energy for them. PRINTING FEATS I consider it a great honor to have been teaching letterpress at the School of Visual Concepts for the past 14 years, and to play a part in building our program. 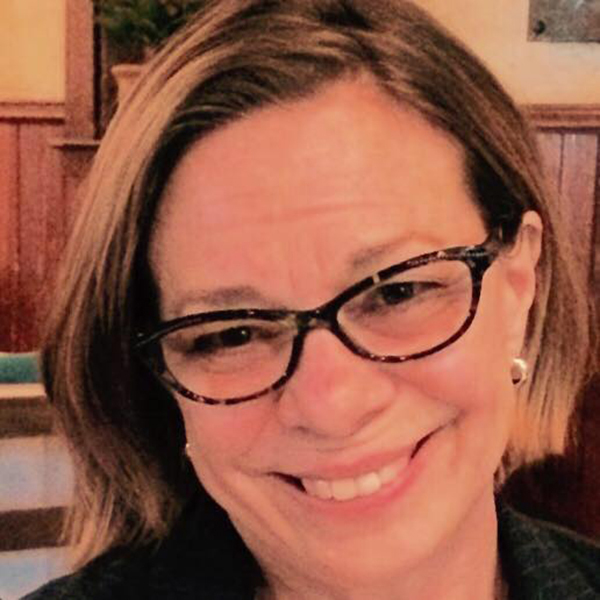 I was cautious when Jenny Wilkson first invited me, as my mentors Chris Stern & Jules Faye were also teaching there — and who was I, with just a few years at the press under my belt, to be teaching? Upon hearing my concerns, Chris and Jules invited me to assist in their class — and gave me their encouragement to accept Jenny’s offer. This wasn’t an issue of confidence; it was about respect for all the years Chris and Jules had spent in front of presses. 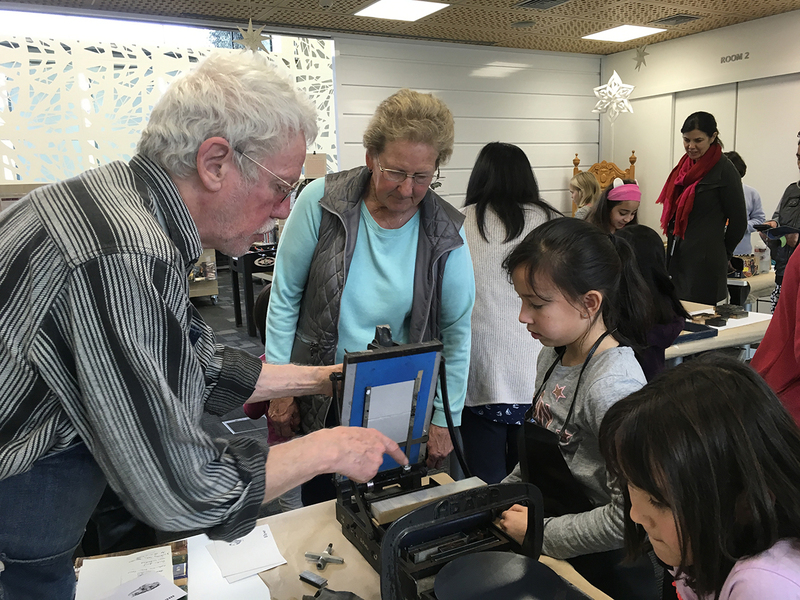 top photo: We have a well-appointed shop at the School of Visual Concepts, and our volunteer Teaching Assistants do their part (and then some) to making sure it remains a gem. Credit: Radford Creative. | bottom photo: Elizabeth Mullaly (right) is one of my current Teaching Assistants. The way she quietly jumps right in when she sees something or someone that needs attention is a work ethic I admire. Credit: Sukhie Patel. 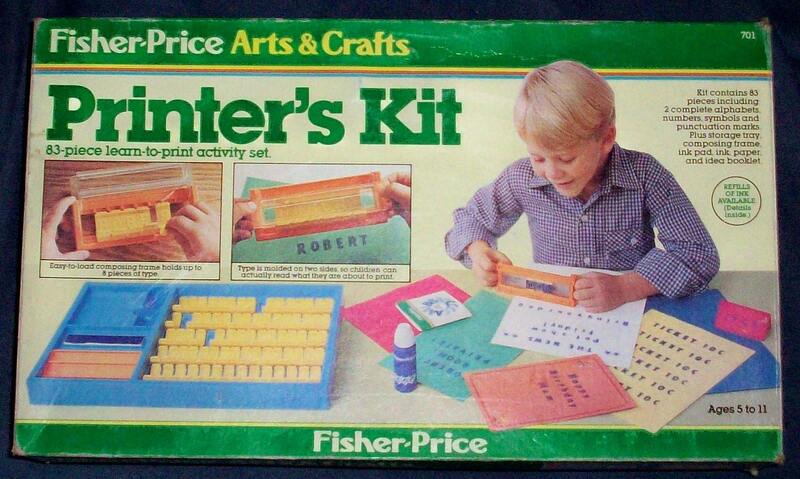 PRESS HISTORY I was about to say it was a Pilot Tabletop Press — but truly, it was a toy press given to me in elementary school, the Fisher Price Arts & Craft “Printer’s Kit”. I’m really hoping it’s still stashed in my parent’s basement, as I’d love to get it back and play around with it. But as far as “real” presses go, the Pilot really was my first. In June of 1999, I went to Bellingham, WA with Chris Stern & Jules Faye to visit their friend Rob. We were talking about printing and I was admiring his 7×9 Pilot Press sitting in the corner on its original stand. After a while Chris turned and said, “Well Amy, you can have it if you can pick it up.” I laughed and then saw Rob nod his head — Chris was actually serious, and Jules confirmed it. Together we moved it out that day. 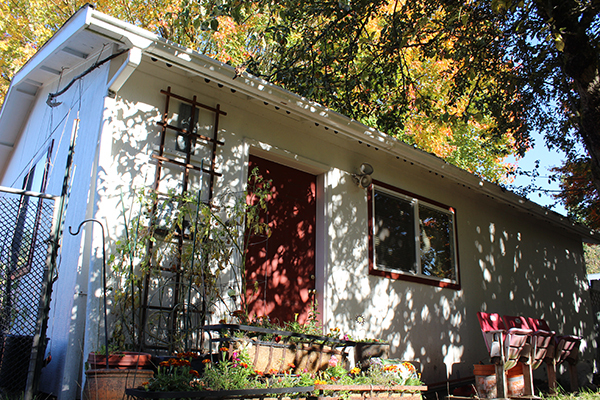 My first studio was efficiently tucked into a tiny breakfast nook in a shared house. We didn’t use the dishwasher, so it became my ink table— I kept ink and tools on its racks. I lovingly refer to this 50-pound case of figures as one my apprenticeship “hazing” moments. 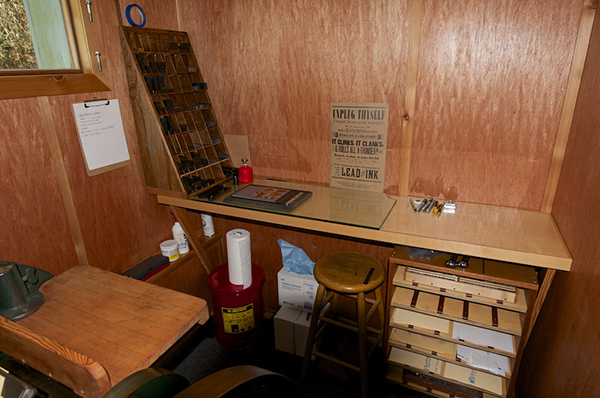 I had the Pilot for 2 years, and when I moved into the bindery loft of Stern & Faye’s Print Barn, they convinced me that it was time to move on to a bigger press. To this day, the Pilot still lives in Seattle with John Marshall, former owner of Seattle’s Open Books Poetry Shop in Seattle. It’s nice to know it’s still in our Pacific Northwest literary letterpress family. BOXCAR’S ROLE Boxcar has been making my photopolymer plates since — I think — 2003 or 2004. At that time there weren’t many options, and most required faxing in a proof of the artwork — which was a royal pain. But Boxcar spoke my design language and accepted PDF proofs (revolutionary!) and that was the hook that got me in the door. But the real reason I keep coming back is the people — everyone is so helpful and accountable to doing good work, and I appreciate the time spent helping me troubleshoot. As an instructor I know I can direct my students to Boxcar and that they’ll be well-taken care of. 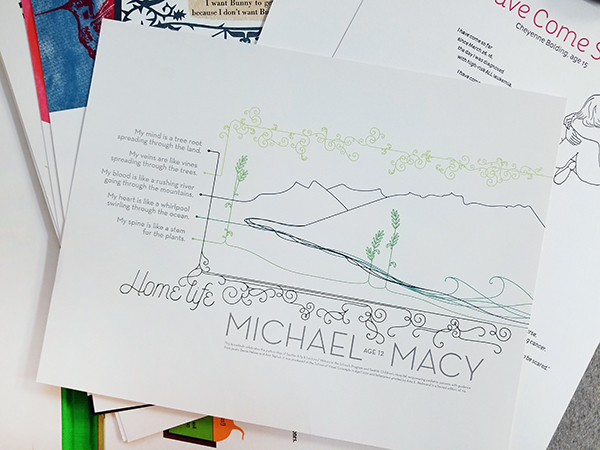 And as a participant in SVC’s Poetry Broadside project with Seattle Children’s Hospital and Seattle Arts & Lectures, I know that the project would not be financially possible without plate donations from Boxcar and paper donations from Neenah. On behalf of the printers at the School of Visual Concepts, thank you! PRINTING TIPS Roller bearers are my best friends — I never lock up a form in a chase without them. Also, always use protection: slipsheet your prints. These two simple things can prevent so many problems. Wide, type-high rule placed on the inside edges of the chase act as roller bearers, preventing ink slur as the rollers roll on/off the form. Document your work. 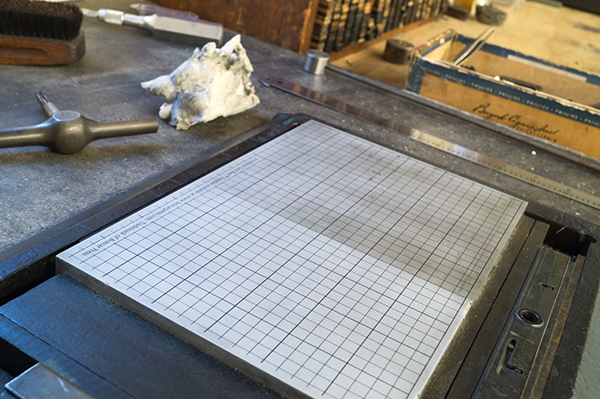 David Black, another letterpress instructor at SVC, once advised starting a shop log to keep track of press maintenance. I do, and it has become so much more than just a record of press oiling. I document ideas, typeface choices, and archive my mockups. These logs are valuable resources that I refer to often. I currently have 4 studio logs, and added a fifth just for the projects I do for APA (Amalgamated Printers Association), of which I’m a member. And finally, when it comes to buying equipment, be patient. The right press, the right type, it will come along. Talk to people, get to know them… there’s an underground current of dedicated printers that offer a far more rewarding experience than a whirlwind bidding session on Ebay will, and you’ll meet people genuinely interested in your success if you take the time to invest in your local community. 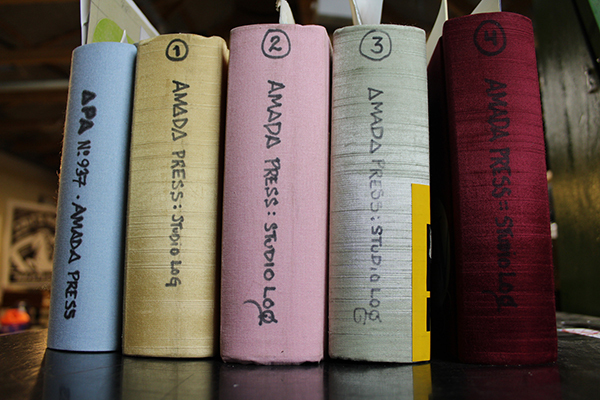 WHAT’S NEXT I’m finally — finally!— going to set up an online store for Amada Press. I’ve been in several group and solo shows over the years, but the positive response my work received in the 2017 “Pressing On” Exhibition at Hatch Show Print really highlighted the importance of investing time into making my work more accessible. I also have several ideas on my perpetual project list in different stages of production, including two book concepts and a long-form broadside. The more I cross off, the more room I have for new ideas. My work is fueled by motion. 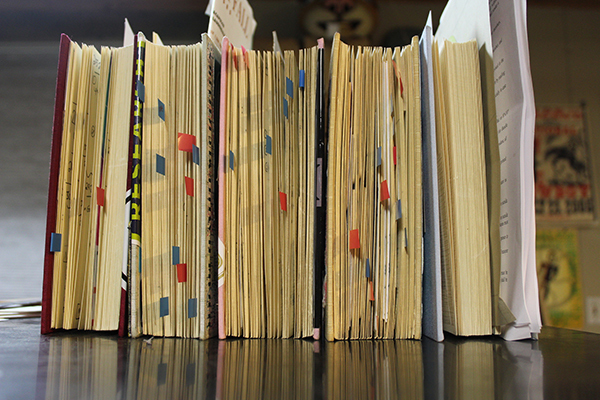 The red and blue flags in my studio logs mark ideas that have not yet been printed. I’m happy to say it’s a never-ending list. 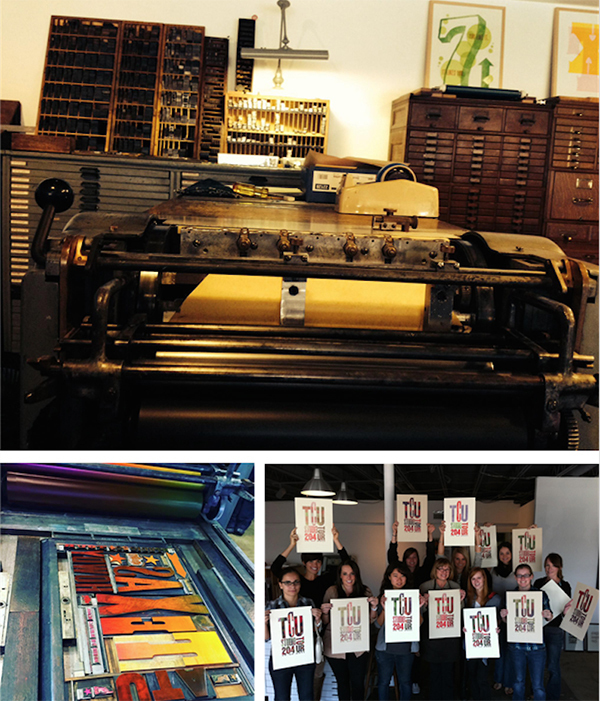 Immensely huge round of applause & thanks out to Amy for the gorgeous peek into the printing realm of Amada Press. 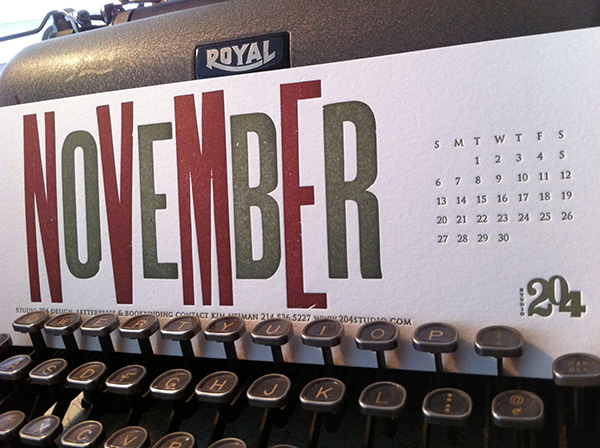 Keep up the beautiful work and we look forward to seeing more of your printing adventures unfold. Find her on Instagram too (@AmadaPress)! 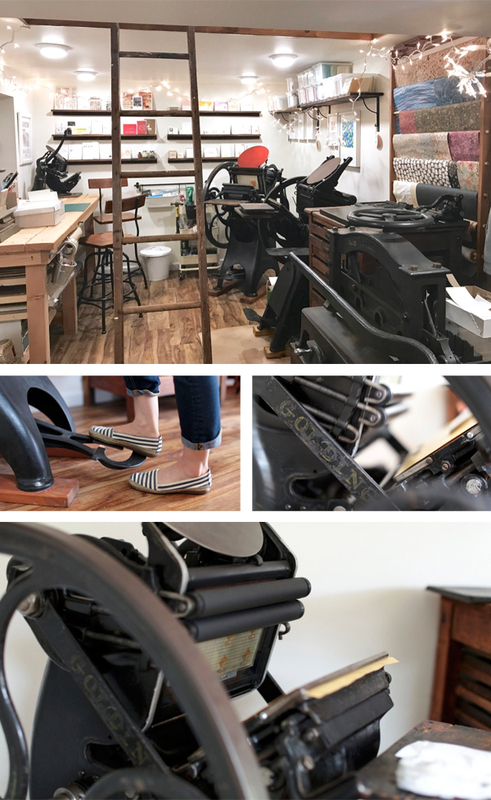 From middle of the night press checks to early morning calls to her printshop mentor, Kim Neiman of STUDIO 204 has carved out a beautiful living printing to her heart’s content in her spacious Arlington, Texas studio. 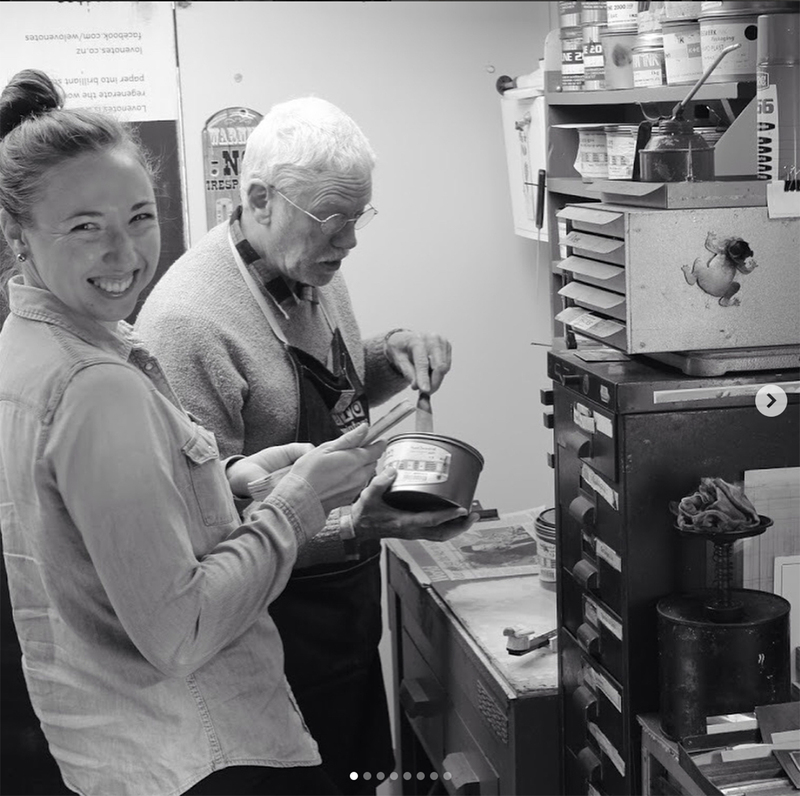 Teaming up with her wonderful husband, Kim enjoys the freedom of press pursuits, sharing the alluring hum of printing with workshops, and inspiring a new generation of designers & printers. A STUDIO BUILT FOR TWO I have practiced graphic design for the past 39 years. 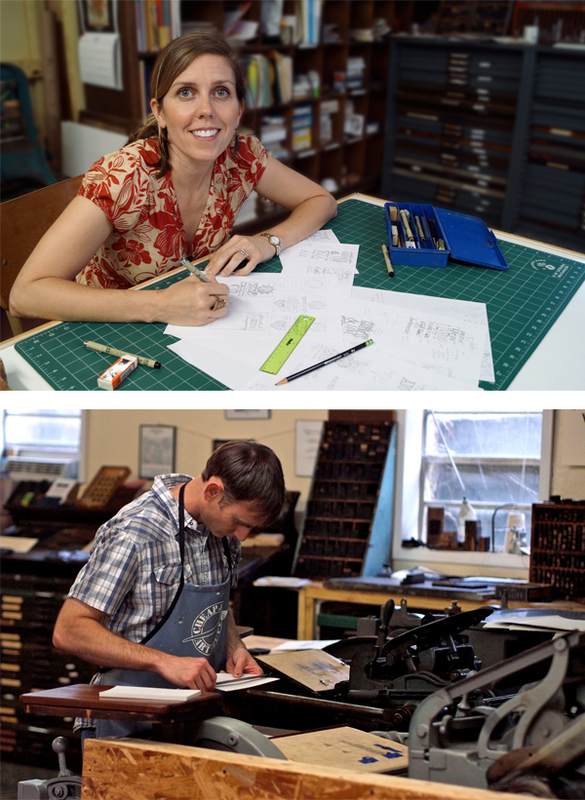 The last 10 years involved learning and practicing letterpress printing and bookbinding. 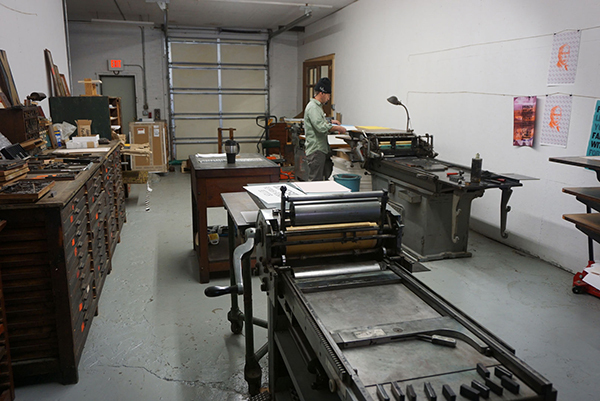 Purchasing a 219 Power Vandercook required more space, so my husband and I decided to relocate the studio to his father’s former 1950’s television shop in Arlington, Texas. Studio 204 is located in the historic area of downtown Arlington which is going through an extensive revitalization. LETTERPRESS’S ALLURE As a designer, I learned printing in the middle of the night when I received a call that my job was on press and they needed someone to approve the printing. Hardworking pressmen held the press until I arrived to review the work. There were no female printers in those days and it could be intimidating but that is where I learned to print. 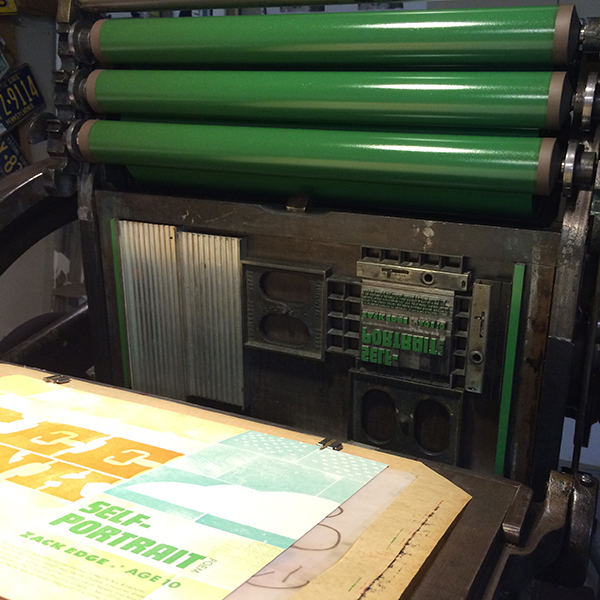 All those years press checking paid off when letterpress reemerged. 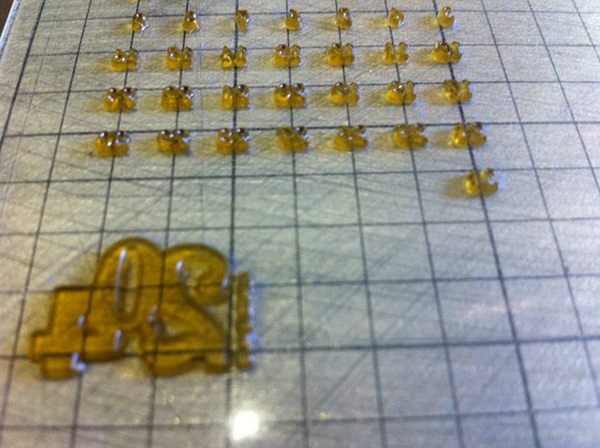 Now “I” can print and experiment with no restrictions. 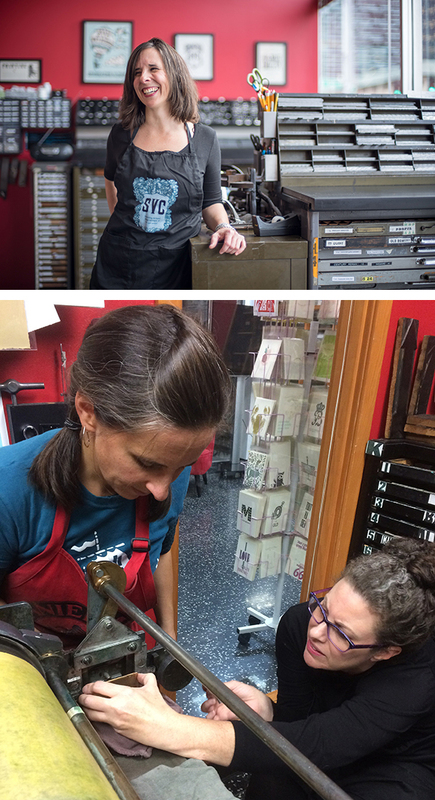 PRINTING MENTORS Casey McGarr of Inky Lips Press is my print mentor and hero. He was and still is my 24-hour print crisis line and I owe him a great deal. 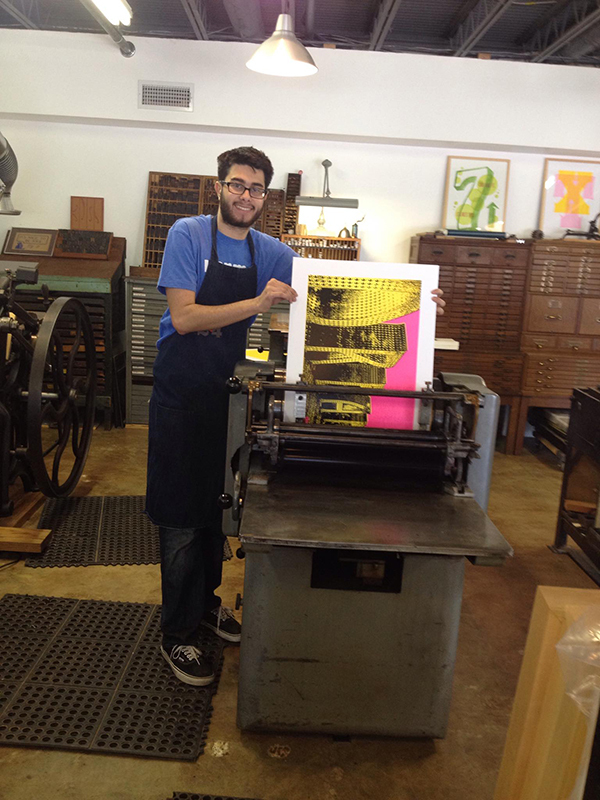 My husband — a print designer as well — and I share the studio and presses. He is my constant inspiration and biggest fan. FAVORITE INK COLOR Favorite ink at the moment is any fluorescent printed on Astrobrights neon paper. DESIGNER & PRINTER I am a graphic designer, printer, bookbinder and a teacher. My process begins with research, design, experimentation and fabrication— though not necessarily in that order. A EUREKA MOMENT One time I scanned a python skin, created a bitmap and sent it for plates. Before Boxcar made the plates they called to ask what it was? A bit skeptical, the next question was, what are you going to do with it? I told them I was going to print it on Pulsar Red Curious Cosmic. 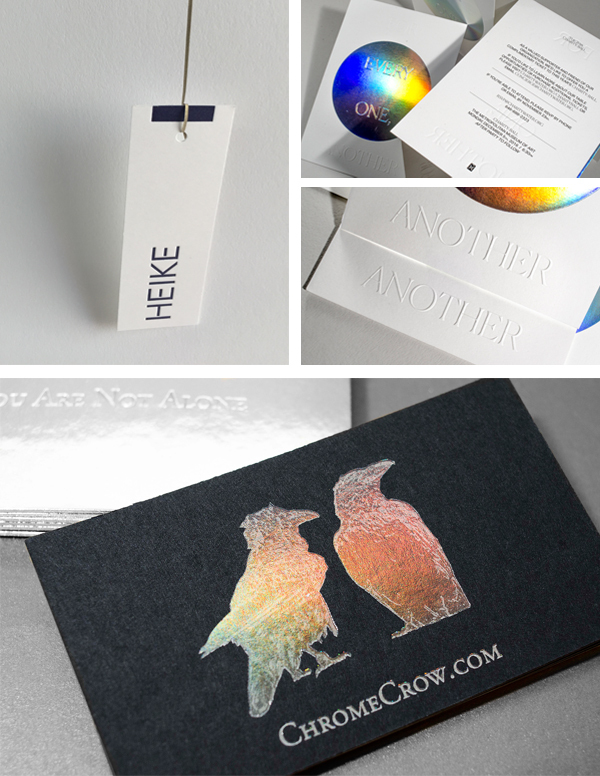 Curious Cosmic is a soft matte metallic coated paper, but when I printed on it became glossy and reflective. Eureka, it looked like I had foil stamped it. My client who designs couture handbags made from python was impressed. 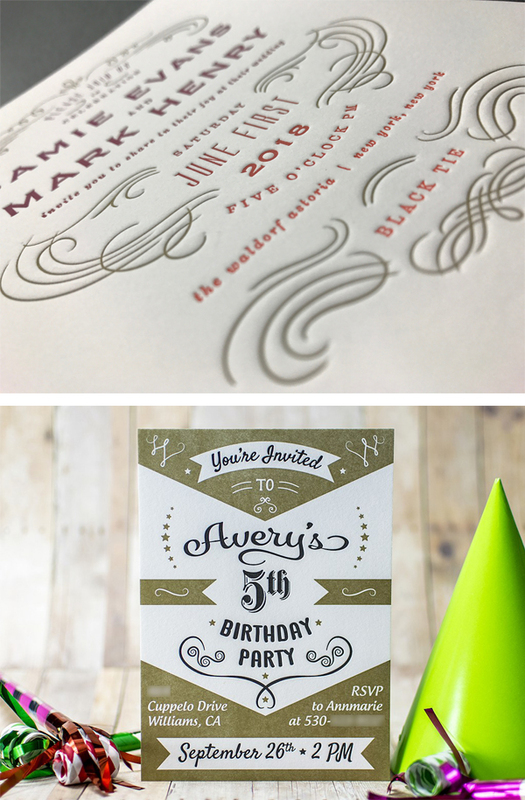 So we printed all her invitations with the python pattern on different metallic paper. She is now making a python clutch bag. Metallic foil is applied directly to the skin before the bags are sewn. PRINTING FEATS For 10 years I was fortunate to work with David Carter Design developing print collateral packages for five-star resorts on many continents. My last assignment was rebranding The Stoneleigh Hotel in Dallas, Texas, the place I called home. PRESS HISTORY First and still is my 219 Power Vandercook. BOXCAR’S ROLE Boxcar’s customer service is a rare commodity and I talk about it all the time. Their knowledge is the best in the business. 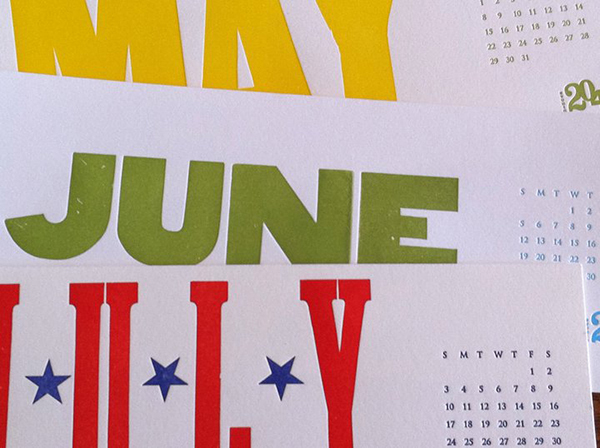 LIFE (AND SHOP) TIPS Keep print alive. Pay it forward. WHAT’S NEXT More printing, more experimentation, more design, more teaching and cooking lessons in Southern France. A huge round of thanks & applause out to Kim of STUDIO 204. May the future printing roads always rise up to meet you!